R S Ward1, P L Smedley1, G Allen2, B J Baptie1, M R Cave1, Z Daraktchieva3, R Fisher5, D Hawthorn1, D G Jones1, A Lewis4, D Lowry5, R Luckett1, B P Marchant1, R M Purvis4 and S Wilde4. 2018. Environmental baseline monitoring: phase III final report (2017–2018). British Geological Survey Internal Report, OR/18/026. This section of the report discusses ongoing baseline measurements of atmospheric composition (greenhouse gas and air quality indicator concentrations) sampled near to the Little Plumpton and Kirby Misperton drilling sites, and discusses climatological relationships between concentrations and other factors such as time of day, week, year, and prevailing meteorology. For a further detailed discussion of the definition of an atmospheric baseline in this context, see the Phase 1 and Phase 2 project reports (Ward et al, 2017 and Ward et al, 2018: http://nora.nerc.ac.uk/id/eprint/520354/ and http://nora.nerc.ac.uk/id/eprint/517889/), which also detail the scientific measurement rationale, site selection criteria, infrastructure and instrumentation, and details of data provision and access. 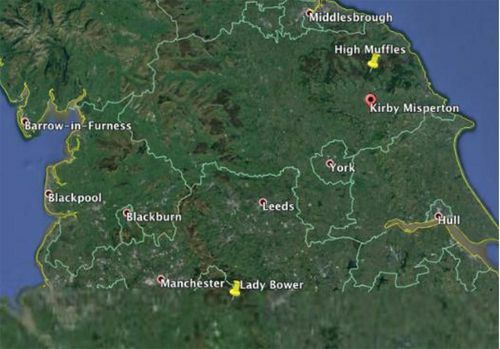 The Universities of Manchester and York have been carrying out measurements for air quality and greenhouse gas concentrations for a near-continuous period of 24 months to define intra-annual and annual baselines for Kirby Misperton (‘KM’), in the Vale of Pickering and Little Plumpton (‘LP’) in the Fylde. In the remainder of this report, the analysis of data for greenhouse gases (Results to Summary and overall conclusions on greenhouse gas baseline monitoring and outcomes) is provided by authors from the University of Manchester. 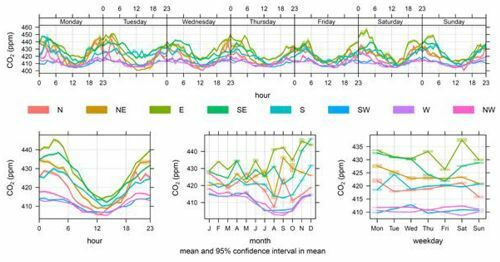 Analysis of air quality data (Air quality to Summary of air pollution measurements) is provided by authors from the University of York. 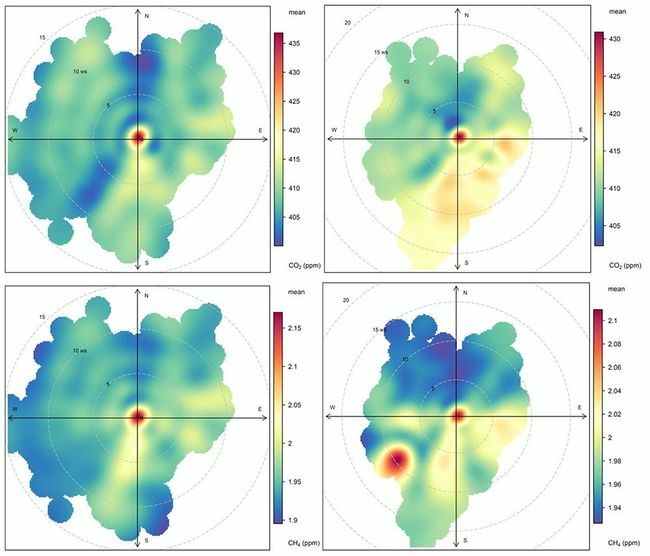 Mobile survey case studies to characterise local and regional methane sources around each site, using isotopic fingerprinting, were conducted by, and a reported by authors from, Royal Holloway University London. 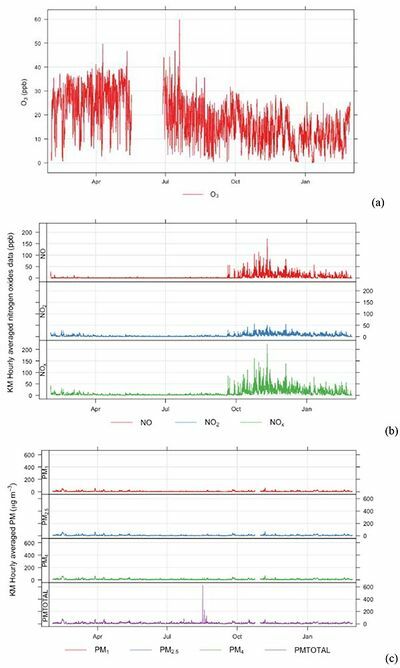 The analyses in this report draw on high-precision greenhouse gas (carbon dioxide and methane) measurements, key air quality trace gas (ozone, nitrogen oxides and non-methane hydrocarbons) and particulate matter concentrations, alongside meteorological data. The data considered in this report cover the period between February 1 2017 and 31 January 2018 for meteorology and greenhouse gases, and between February 1 2017 and 31 February 28 2018 for air quality parameters. The data reported here is self-consistent in terms of methodology and can be compared between sites and also with the equivalent preceding calendar year, as presented in our Phase 2 report (Ward et al 2017). From September 2017, mobilisation of equipment for hydraulic fracturing operations began at the KM8 site. This involved significant HGV traffic movement to/from the site and the placement/construction of temporary infrastructure (e.g. sound barrier, work-over rigs, storage tanks etc). These operations continued throughout the winter of 2017/18 and were still continuing at the time this report was prepared. The mobilisation on site has resulted in a change to certain air quality parameters, e.g. NOx, and these have been highlighted in the report. 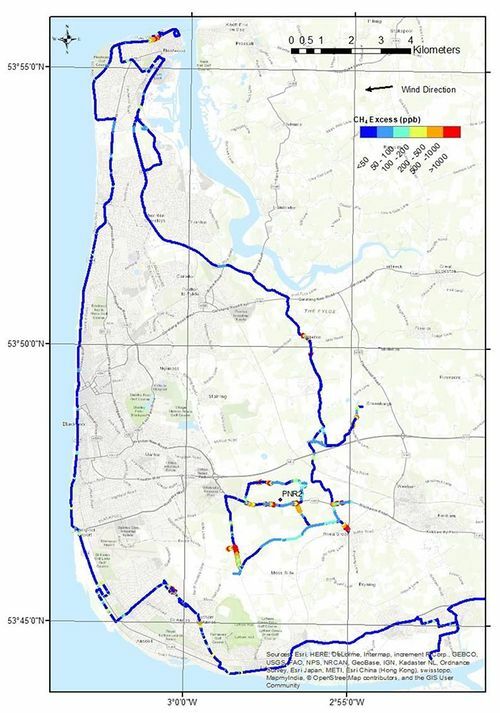 Detailed analysis has not yet been undertaken as site works were still continuing, but once these have finished the data set will provide opportunity to evaluate the impact of site mobilisation on air quality and the transition from baseline to a pre-operational state. Not all parameters have shown a change. There has been no observed change in greenhouse gas emissions as methane is not yet being extracted from the KM8 site and none of the other equipment transported to site is expected to emit methane or carbon dioxide. We do however note a possible continuing long-term fugitive emission of CH4 from the KM8 pad infrastructure itself, which is noted in the report. 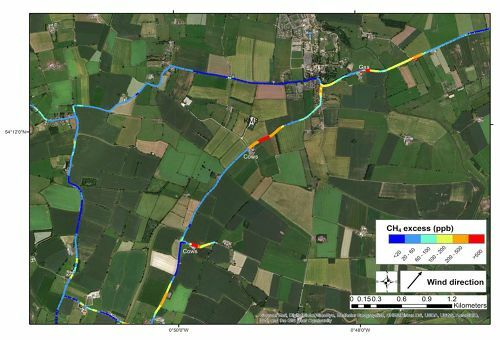 Site selection is described in detail in the project’s Phase 1 report and the site selection strategy for environmental monitoring in connection with shale-gas exploration: Vale of Pickering, Yorkshire and Fylde, Lancashire in Smedley et al. (2015). Royal Holloway University London added a Los Gatos Research Ultraportable Methane-Ethane Analyser (LGR UMEA) to mobile measurement capabilities in October 2017 to allow for quick identification of leaks in the gas distribution system and to gain insight into the usefulness of methane:ethane ratios to identify gas from different sources. This was used in all subsequent mobile surveys around the LP and KM locations. Data have continued to be collected at both KM and LP over the past year (2017–2018). Any technical or mitigating issues with the monitoring and the associated dataset are highlighted in the following subsections. Monitoring has continued at the Little Plumpton site, with the additional installation of a hydrogen sulphide instrument (H2S). There have been some technical instrument issues throughout the past year: methane, carbon dioxide, particulates and ozone instruments have experienced short-term technical equipment failures, but these were rectified as soon as possible (within days or weeks) and these events are highlighted in the relevant section below. These instrument failures are not atypical of long-term field-based monitoring, and each event has provided additional insight into instrument performance and suitability. Monitoring has continued at the Kirby Misperton site, with additional H2S measurements added to the suite of measurements during this reporting period. From 19th September 2017, Third Energy were permitted to bring equipment on to KM8 wellsite that would be used for hydraulic fracturing and flow testing. From an air quality perspective this meant the measurements at the site after this date could no longer be classed as baseline. Hence, from this point onwards for the reporting period covered by this report, the monitoring is defined as ‘pre-operational’. A sound barrier was also erected around the wellsite, this was constructed from steel containers, scaffolding above and plastic sheeting. This was not ideal for the atmospheric measurements as it meant the instruments could no longer sample unperturbed airflows in all directions. To alleviate this problem all gas inlets were extended to 9 m above ground level at the top of the scaffold sound barrier. The weather station was also repositioned there. It was not possible to move the Particulate Matter (PM) instrument inlet due to the requirement for a fixed, calibrated, heated inlet. This means that from 19th September 2017, PM measurements were no longer representative of wider region air quality as locally-derived (site) pollutants may be pooled within the area surrounded by the sound barrier at low wind speed. Calibration and quality assurance procedures in the Phase 3 (2017–2018) baseline period have continued to follow those outlined for the Phase 2 (2016–2017) period to ensure consistency and continuity in the dataset. Data from both sites employ quality assurance (QA) and quality control (QC) for air quality and greenhouse gas concentration data covering all aspects of network operation, including equipment evaluation, site operation, site maintenance and calibration, data review and ratification. All instrumental calibrations are traceable through an unbroken chain to international reference standards to ensure high accuracy, comparability with similarly calibrated high-precision instrumentation, and quantified uncertainties in the dataset. Metadata concerning the precision and guidance on use of the data is prepared for each measurement reported and made available to view publicly on the Centre for Environmental Data Analysis (CEDA) archive (www.CEDA/ac/uk) after final QC approval. Site visits occurred at 3-weekly intervals to check the condition of instruments and to perform checks on analyser accuracy, precision and response times, as well as calibration. A full list of instrument technical specifications and precision is available in the Phase 2 project report (Ward et al, 2017). The Picarro G2301 instrument used to measure methane concentrations during mobile surveys has very low long term drift upwards of <0.1%/yr. It is calibrated to the global WMO scale using 3 standards in the range 1.8–2.1 ppm between mobile surveys and short term variability is <0.05% of the known values. Each survey day of raw data is corrected using the calibration closest in time before utilisation. The principal meteorological variable of interest to baseline characterisation and pollution source interpretation is the local wind speed and direction, as an indicator of the local and regional airmass history (i.e. what source(s) of pollution the sampled airmasses may have been influenced by upwind). The instantaneous wind speed and direction can elucidate relatively nearby sources of pollution (within ~10 km) where repeated and consistently elevated concentrations of trace gases may be observed to correlate with particular wind direction and wind speed. When considering longer-range sources of pollution (such as may be added over cities many 10s or 100s of km upwind), the timescales of interest to airmass history typically extend to no more than around 5 days. Beyond this time, the uncertainty in the path of air upwind (and the chemical changes in such air) increases and interpretation becomes more speculative. Therefore, we limit our analysis to these timescales of advection only. In Little Plumpton wind climatology and Kirby Misperton wind climatology we describe the climatology of winds observed at the sites and discuss their meaning in the context of pollutant gas concentrations and emission sources that have been observed at the measurement stations. 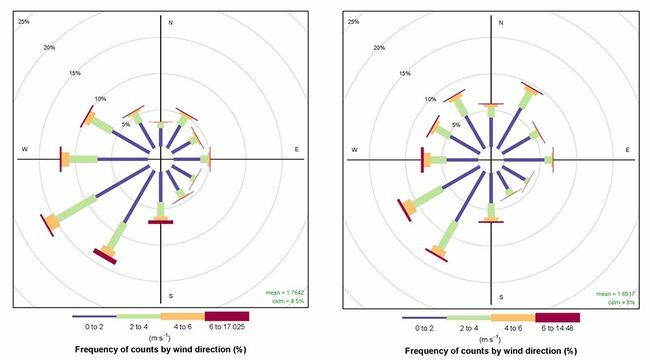 The wind speed and wind direction statistics observed at the LP site over both the 2016–2017 baseline (left panel) and 2017–2018 baseline period (right panel) for comparison, are shown in Figure 32 as a conventional wind rose. This type of illustration shows the frequency (in percent of total time) of instances when wind blows from various directions (seen as the vector and radius in Figure 32). The colour scale in Figure 32 then illustrates the corresponding proportion of wind directions measured from each direction for a range of surface wind speeds (see colour legend in Figure 32). It should be noted that the 2016–17 data (left panel of Figure 32) presented here differs very slightly to that presented in our Phase 2 report due to a 21- degree bias error in measured wind direction that was detected and corrected in October 2017 at the LP site, and will also be corrected in the final dataset provided to CEDA. This does not materially affect earlier conclusions made in our Phase 2 report (Ward et al, 2017) and does not affect summary climatological statistics regarding trace gas concentrations. However, LP wind data presented here should be considered prime. It should also be noted that due to storm damage there is no wind data between 17/10/2017–31/10/2017. Figure 32 Wind rose for the LP site, showing wind speed and direction statistics for: (left): 1 Feb 2016–31 Jan 2017; (right): 1 Feb 2017–31 Jan 2018. The radius defines the percentage of total time in each of 12 wind direction cones (30 degree span), while the colour scale (see colour legend) defines the wind speed. © University of Manchester, 2018. As expected at the LP site (as for any exposed site in the UK), the dominant wind direction in both periods is from the north-west to south-west quadrant (~30–40% of the time in both years), consistent with the site’s location on the west coast of the UK mainland and exposed to flow associated with the Atlantic mid-latitude storm track. This is also the direction from which the strongest winds are observed (red and orange colours in Figure 32), typically coinciding with the passage of mid-latitude cyclones near to, and over the UK mainland. Within this quadrant, the dominant wind speed is between 6–12 m/s (red colours) in both years, followed by frequent wind speeds between 2–6 m/s, with extremely strong winds peaking up to 20 m/s in very rare storm conditions (<0.5% of the time). The consistency of the wind climatology across both annual periods demonstrates the power and comparability of the statistical baseline approach. As discussed in the Phase 2 report, this wind climatology has important implications for the local baseline. The position of the LP site near to the Blackpool shoreline means that winds bringing air from the Atlantic may typically be expected to carry relatively well-mixed and background airmasses to the LP measurement site. In this context, a background can be conceived to be an airmass relatively unaffected by local or regional pollution sources, broadly representative of the average composition of Northern Hemispheric air at the time. These airmasses often represent the Northern Hemispheric seasonal average concentrations of greenhouse gases especially well, as these gases are relatively inert on the time and spatial scales of advection across the Atlantic in mid-latitude cyclones. As these airmasses dominate the statistical climatologies at the LP site in a consistent way year-to-year, the baseline for this wind direction provides a very useful background from which to assess future local changes in pollution sources in the immediate upwind vicinity. The position of the LP site just 300 m directly to the east of Cuadrilla’s Preston New Road shale gas site makes the dominant westerly wind direction highly favourable for potential future operational comparative assessment. Winds from the southeast were also frequent, accounting for 22% of the 2016–2017 period, and 18% of the 2017–2018 period while northerly and easterly quadrant wind directions were less frequent, representing <20% in each quadrant over the course of each baseline period. Wind speeds for these quadrants (all other than westerlies) were also typically much lighter (dominated by light breeze winds in the range 2–4 m/s, followed by stagnant winds classified as 0–2 m/s). This is due to a number of factors: 1) that winds from these directions are moderated by passage over the mainland UK land surface, and 2) that winds from these directions typically represent flow in less frequent high pressure regimes to the north and east or from low pressure systems to the south and west. Light winds from these directions will typically carry airmasses that have spent a significant time in dynamic contact with the surface of the UK mainland and may also represent air that has passed over Western Europe. Therefore, these airmasses may be expected to typically contain pollution added to surface air as they pass over a range of anthropogenic (manmade) and natural sources of greenhouse gases and other pollution upwind of the measurement site. Such sources include cities, landfill, industry, transport, agriculture etc. This air may be a mix of both local (<10 km distant), regional (UK mainland) and more distant (Western Europe) pollution sources, making it difficult to quantitatively deconvolve the relative inputs of each. However, the frequency and duration of transient enhancements seen in trace gas concentration data offers important markers of the proximity (and type) of pollution source, as regionally impacted airmasses will typically display broad (longer timescale) and more invariant enhancements relative to background westerly airmasses, while local inputs are often seen as sharper and shorter-lived enhancements. This will be discussed further in the following sections, making use of additional airmass history tools such as back trajectory analysis. The wind speed and wind direction statistics observed at the KM site over the 2016–2017 and 2017–2018 baseline periods are shown in Figure 33, again as a conventional wind rose. 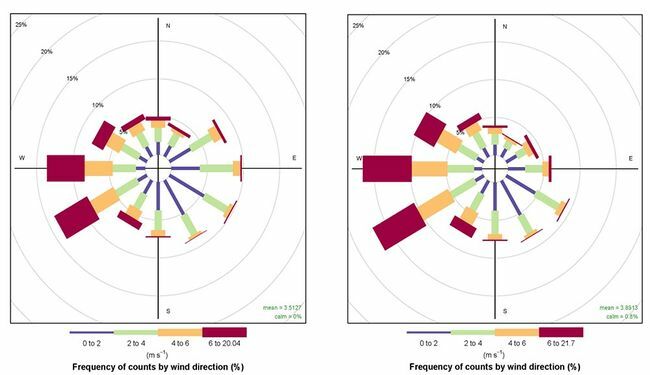 Figure 33 Wind rose for the KM site, showing wind speed and direction statistics for: left: 1 Feb 2016–31 Jan 2017; right: 1 Feb 2017–31 Jan 2018. The radius defines the percentage of total time in each of 12 wind direction cones (30 degree span), while the colour scale (see colour legend) defines the wind speed. © University of Manchester, 2018. The dominant wind directions are from the western and southern quadrants (collectively accounting for 40–45% of the time in both annual periods), with the most frequent winds from a south-westerly direction (>30% of the period in both cases). This is also the direction from which the most frequent strongest winds are observed (red colours in Figure 33), typically coinciding with the passage of mid-latitude cyclones over the UK mainland. Within this westerly quadrant, the dominant wind speed is between 2–4 m/s in both years, with occasionally strong winds peaking between 15–17 m/s in storm conditions (<0.5% of the time) over both periods. It should be noted that the frequency of strong winds above 6 ms-1 (~3% of the time) is much reduced compared with the LP site due to its more inland and easterly location. Northerly, easterly and southerly quadrant wind directions were less frequent in both years, representing 8–20% in each quadrant over the course of each 12 month baseline. Wind speeds from these quadrants were also dominated by light breeze conditions in the range 0–2 m/s with wind speeds rarely exceeding 6 m/s in either period. This is broadly due to the same factors that define the LP wind climatology: 1) that wind speeds from those directions are moderated by passage over the mainland UK land surface, and 2) that winds from these directions usually represent flow in less frequent high pressure regimes to the north and east or from low pressure systems to the south and west. An important difference between the LP and KM site is seen in the strength of westerly and south-westerly winds, which appear to be significantly moderated by virtue of the position of KM far inland from the western coast of the UK mainland. The dominant wind direction is south-westerly, which is consistent with observations at LP over the course of both baseline periods. This can be expected to be linked to the track of mid-latitude cyclones, which typically follow a direction toward the northeast as they pass over the UK mainland, especially between late autumn and early spring when storm activity (and hence wind speed) is climatologically most intense. These subtle differences in wind speed and direction between the two sites, but the consistency of the climatology year-to-year at each site separately, suggest that pollution sources contributing to airmasses arriving at the KM site from different wind directions will differ greatly, especially for westerly and south-westerly directions, but that such sources will be internally consistent at each site separately by virtue of the similarity year-to-year. Winds from the west and south will typically represent airmasses that have spent a significant time in dynamic contact with the surface of the UK mainland and may also represent air that has passed over the cities of the midlands and North West England. Such airmasses may be expected to typically contain pollution added to the surface air as they pass over a range of anthropogenic (manmade) and natural sources of greenhouse gases and other pollution upwind of the measurement site, such as cities, landfill, industry, transport, agriculture etc. This air may be influenced by a mix of both local (<10 km distant) and regional (UK mainland) sources. A further difference at the KM site relates to (albeit infrequent) easterly and south-easterly wind directions, which, unlike LP, represent airmasses that have more recently passed over Europe. To summarise, the position and wind climatology observed at KM preclude the more obvious definition of a “background” wind direction (as is the case for westerlies at LP), that can be assumed to represent a Northern Hemispheric average compositional state. The position of the KM site to the east-south-east of the Third Energy site makes the north-west-westerly wind direction optimal for any future operational comparative assessment with the caveat that the more variable nature of polluted airmasses from this wind direction (due to other regional UK sources upwind) may lead to more variable concentration statistics when diagnosing any future incremental changes due to on-site activity. However, as in the case of LP, the frequency and duration of transient enhancements seen in trace gas concentration data offers important evidence for the proximity (and type) of pollution source, as regionally impacted airmasses will typically display broad (longer timescale) and more invariant enhancements relative to local inputs, which are often seen as shorter-lived but more intense enhancements. The closer proximity of the KM site to the drilling operations (just a few metres) also means that more significant but transient enhancements would be observed compared with those observed at LP due to dilution and dispersion and the quantification of emission flux (for greenhouse gases) is significantly more problematic, due to turbulent flow and an inability to make idealised assumptions implicit to many conventional flux methods such as eddy covariance, Gaussian plume inversion, and mass balancing. This will be discussed further in the following sections. This Section reports and discusses the greenhouse gas baseline periods for both the LP and KM sites. The analysis of the air quality baseline will be presented separately in Air quality. We present the statistical analysis of the greenhouse gas baseline dataset and mobile vehicle surveys of nearby greenhouse gas sources at each site in turn; and interpret this in the context of sources of emission and background using meteorological (and other) data to aid analysis. Figure 34 illustrates the measured ambient CO2 and CH4 concentrations at LP as a function of time across the baseline periods sampled at the fixed measurement site positioned ~300 m to the east of the Cuadrilla site perimeter. 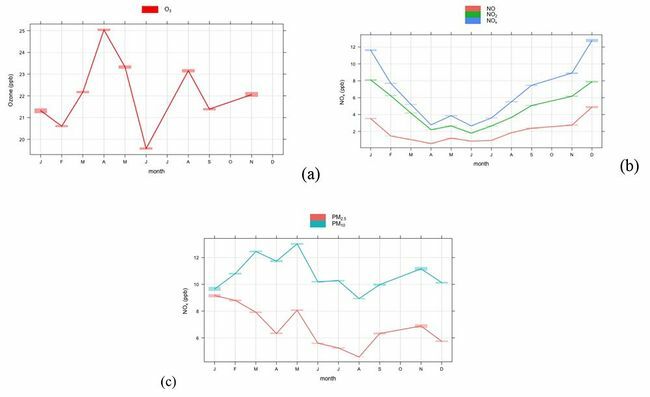 Figure 35 and Figure 36 go on to illustrate how the measured concentrations relate to their coincidently-measured wind direction for each greenhouse gas, while Figure 37 and Figure 38 show the same information but also display how the relationship between measured concentration and wind direction varies as a function of time. Figure 34 Time series of carbon dioxide (red) and methane (green) in units of ppm measured at LP between: 1 Feb 2016 and 31 Jan 2017 (top panels); 1 Feb 2017–31 Jan 2018 (bottom panels). © University of Manchester, 2018. Both CO2 and CH4 datasets exhibit a well-established background concentration for each species. These background concentrations, ~400 ppm for CO2 and ~2 ppm for CH4, appear broadly consistent in both baseline periods from Figure 34, but examination of the lower percentiles in Table 11 and Table 12 reveals that both CO2 and CH4 concentrations increased in 2017–18 relative to 2016–17. This is consistent with observations at background monitoring sites across the Northern Hemisphere, which reflect the continued annualised global increase in background concentrations of these greenhouse gases, and can also be seen in Figure 35 and Figure 36 as a reduction in the proportion of measurements in the lowest two bins (represented by green and blue colours). Both species also exhibit a seasonal cycle in concentration. This is particularly pronounced for CO2 where increased biospheric uptake during the summer relative to the winter causes background concentrations to be depleted. A similar pattern exists for CH4, driven by changes in removal processes (largely through reaction with the hydroxyl radical) and emission sources, but this is less significant in the context of typical CH4 variability at the site due to local and regional emissions (as seen in Figure 34). From Figure 35 and Figure 36 it can be seen that periods of enhanced CO2 and CH4 above these background concentrations are more frequently associated with wind directions between 0 and 180 degrees. This can also be seen as a function of time from the colour-coded-time-series in Figure 37. As introduced in the previous section, this is expected to result partly from the fact that the majority of CO2 and CH4 sources are land-based and partly as a result of the prevalence of lower wind speeds from this sector, which result in larger enhancements being generated per kg of gas emitted. Very large enhancements of >500 ppm CO2 and >5 ppm CH4 are usually associated with local sources and light wind speeds. For CH4 it can be seen from Figure 35 that this is most commonly associated with easterly wind directions, where there is a strong local agricultural source from nearby farms. 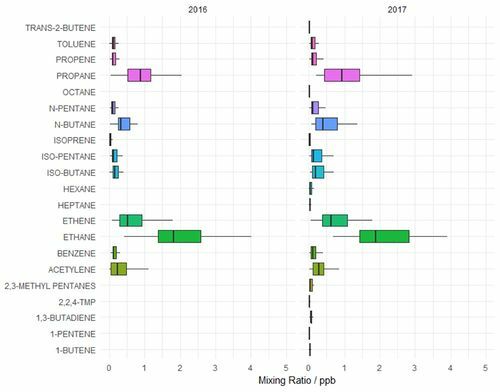 Figure 35 Concentration (as per colour scale) wind roses for methane (units of ppm), as measured at LP for the 2016–17 period (left panel) and 2017–18 period (right panel). © University of Manchester, 2018. 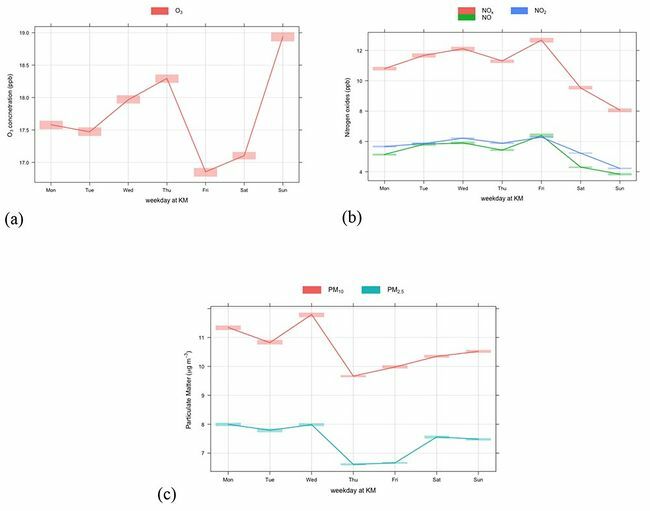 Figure 36 Concentration (as per colour scale) wind roses for carbon dioxide (units of ppm), as measured at LP for the 2016–17 period (left panel) and 2017–18 period (right panel). © University of Manchester, 2018. Figure 37 Concentrations (as per colour scale) in air as a function of time (x-axis) and wind direction (colour-coding) for carbon dioxide (top panels), and methane (bottom panels) as measured at LP for the 2016–17 baseline period (left panel) and 2017–18 period (right panel). © University of Manchester, 2018. A dominant mixing line (traced by red and yellow colours) with a relationship of [CO2]=132.1[CH4]+386.5 ppm (in 2016) and [CO2]=132.4[CH4]+388.5 ppm (in 2017) — representing co-emission (or bulk mixing) of nearby CO2 and CH4 sources upwind to the east and north east (based on understanding of how such concentrations relate to wind direction in Figure 37 to Figure 40). A weaker and broader mixing line with a relationship of [CO2]=7.5[CH4]+386.5 ppm — representing co-emission (or bulk mixing) of CO2 and CH4 regional UK and longer-range sources upwind to the east and south east. A dominant red cluster centred at ~400 ppm CO2 and 2 ppm CH4 in both years — this represents the dominant and frequent background signal seen in westerly Atlantic airmasses (Figure 36 and Figure 37). Note that the darkest red colours in this cluster correspond to >40 total days of measurement each within the baseline period. Figure 38 Coincident CO2 and CH4 concentrations measured at LP for the 2016–17 period (left panel) and 2017–18 period (right panel). Colours indicate the frequency density of sampling (number of coincident measurements). NB One count refers to a one-minute period of data. © University of Manchester, 2018. Mixing lines such as these are a powerful differentiator of source types, especially at the regional and national spatial scale. When temporally averaged (as data in Figure 38 have been), they characterise airmasses that have passed over a large fetch of similar pollution source types and where the airmass has had time to mix internally. The two dominant mixing line modes seen in Figure 38 are seen to correspond to the less frequent easterly, southerly, and south-easterly wind directions. Considering the location of LP, these wind directions represent air that has passed over the Pennines and the cities of Manchester, Leeds and Sheffield in the case of easterlies, and the cities of Birmingham and London in the case of south easterlies. While cities and infrastructure are a principal source of UK pollution (including greenhouse gases), biogenic sources of greenhouse gases, such as the biosphere, landfill and agriculture would also be expected to feature in the fetch of such airmasses when upwind of the LP site. The summative mix of these longer range pollution types upwind for easterly and south-easterly wind directions gives rise to the dominant mixing line observed as the red and yellow trace in Figure 40 and described in summary point 2 above. To interpret more local sources of pollution (within ~10 km), we must focus in detail on the more transient features in the high temporal resolution dataset. To do this on an event-by-event basis for a year of data would be meaningless (and impractical) in the context of the baseline analysis here, though event-led (case study) analysis may well be advisable during any operational phase monitoring. However, it is possible to interpret the relative role of proximal pollutant sources to the overall baseline by considering short-lived but significant excursions from the average baseline and comparing these with wind speed and direction. Figure 39 illustrates a polar bivariate representation of the relationship between both wind speed and direction and greenhouse gas concentration for both baseline years. The colour scale in Figure 39 highlights the wind speed and wind direction conditions that dominate the overall concentration average seen at the measurement site (as a weighted mean of concentration x frequency of occurrence). The red areas seen in all panels (CO2 and CH4) in Figure 39 correspond to light winds (0–2 m/s) from the south east indicating a well-constrained local source for both gases. Given the site’s location, these local (strong) CH4 sources to the south east are strongly expected to be associated with the nearby dairy farm and the nearby A583 main road, while the southerly dominance in CO2 is likely mostly associated with passing traffic on the A583 main road. The fact that the red area does not extend to higher wind speeds in the south east is consistent with an interpretation that longer range sources of pollution may not contribute significantly to periods where the greatest enhancements in concentrations are sampled at the site, i.e. that local sources dominate the strongest enhancements. The role of longer range (regional, national and continental) sources is therefore to add a smaller increment to the much larger local emission sources that dominate periods of enhancement in south-easterly and easterly wind conditions. The lighter blue areas seen in Figure 39 to the west indicate a long range and diffuse source of the greenhouse gases, which is consistent with longer range transport of moderately enhanced airmasses, from Ireland and in intercontinental transport from North America, although this source’s relative contribution to any enhancement over the baseline is very much weaker than those upwind sources when airmasses are received from the south east. Figure 39 Polar bivariate representation of carbon dioxide (top panels) and methane (bottom panels) as a function of wind direction for the 2016–17 period (left panels) and 2017–18 period (right panels). The colour scale represents the fraction of total measurement time weighted for concentration enhancement relative to the global mean (as scaled for colour in units of ppm) and wind speed (defined by the radial component — each radial increment representing 5 m/s). See text for further details. © University of Manchester, 2018. To further differentiate the role of local, regional and more distant (long range inter-continental) pollution sources, we now examine the airmass history, which can be interpreted using Lagrangian back trajectories. Back trajectories are a useful indicator of the path that air has taken in the atmosphere up to and over the previous 5 days. Beyond this time, the accuracy of hindcasted trajectories degrades rapidly due to numerical and meteorological uncertainty associated with Lagrangian transport models and the accuracy of reanalysis meteorological data. Put simply, back trajectories attempt to trace back the path of neutrally buoyant single particles in the atmosphere as they are carried on the wind (this is known as Lagrangian advection). Back trajectory models use wind fields from meteorological reanalyses (hindcasted winds calculated by forecast models that use assimilated measured data). In this analysis, we have used the Hybrid Single Particle Lagrangian Integrated Trajectory Model (HYSPLIT) and hourly United States National Centre for Environmental Prediction Global Forecast System reanalysis meteorological data at a spatial resolution of 0.5° x 0.5°. We have then calculated 5-day back trajectories with endpoints at the location of the LP site at 6-hourly intervals across the measurement period (~1200 trajectories in total between 1 Feb 2016 and 31 Jan 2017 and the same in the 2017–2018 baseline period). Figure 40 shows the airmass history of air sampled at LP throughout the baseline periods (2016 in the left panels and 2017 in the right panels). This statistical representation of the history of air can be interpreted as a surface ‘footprint’, illustrating a surface area over which air measured at LP has been influenced by potential surface sources. 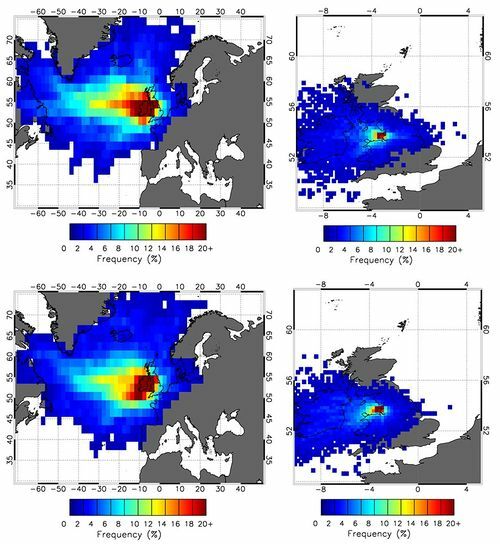 Figure 40 shows the frequency (as a fraction of total time, in this case as a percentage of each 12-month baseline period) that air has passed near to the surface in a latitude-longitude grid with a 1-degree spacing (or spatial averaging grid) over the Atlantic region (left panels) and a 0.25-degree spacing for the UK region (right panels). The red colours indicate that air received at LP is most characterised by air that has previously passed over Ireland and the Atlantic Ocean. It also shows less frequent contact with the near-surface to the north and east. Most importantly, there is a remarkable degree of similarity between the airmass histories at the LP site year-on-year with very little difference to note, which supports the utility of this statistical approach and the conclusions that can be drawn from examining a dataset in this way. We now examine the temporal patterns associated with measured concentrations. The diurnal, weekly, and seasonal variability observed can give additional clues as to the nature of sources and their proximity to the receptor site. Figure 41 and Figure 42 show this for methane for each baseline period, respectively, grouped (and coloured) by wind direction. 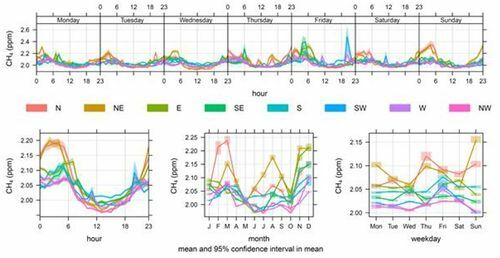 The top panels show the mean diurnal pattern and statistical variability (at the 95% confidence level of sampled variability around the calculated mean) in methane concentration as a function of time of day and day of week, represented as an average over each of the baseline periods. We can clearly see a repeatable diurnal cycle in all wind directions, with a minimum concentration around midday on each day of the week. This pattern is consistent with the ventilation of the local boundary layer, as the height of the planetary boundary layer is lifted by convection in daylight hours (enhanced in summer months relative to winter), further indicating a dominant role for local sources at night, which might be expected to accumulate overnight before being diluted and detrained in daytime. The highest night time concentrations are associated with easterly and north-easterly wind directions, consistent with the earlier conclusion that the nearby dairy farm is a dominant local source. The highest concentrations are also seen in the late autumn and winter months (November to March) in both baseline periods. 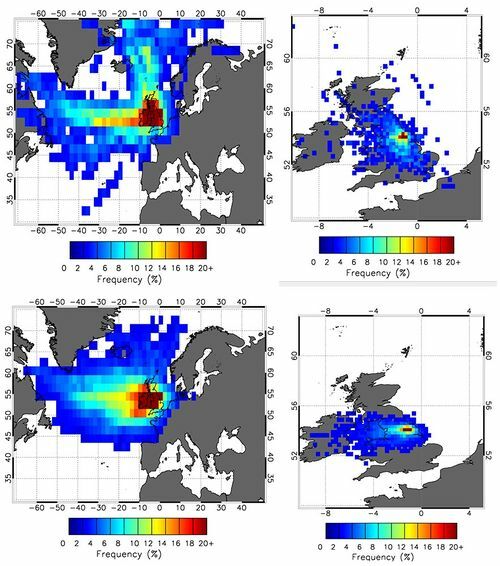 Figure 40 Top panels: 5-day airmass history surface footprint statistics for the period 1 Feb 2016 to 31 Jan 2017 for the Atlantic region (left panels) and UK region (right panels); and bottom panels: 1 Feb 2017–28 Feb 2018, as seen from the LP site at a spatial resolution of 1 x 1 degree (Atlantic region) and 0.25 x 0.25 degree (UK region). Note that frequency refers to the fraction of the total trajectories passing over each spatially-averaged grid cell. © University of Manchester, 2018. Figure 41 Temporal statistics of methane climatology at LP by time and day of week (top panel), time of day (averaged over all days, bottom left), month of year (bottom middle), and day of week (bottom right) for the 2016–17 period. © University of Manchester, 2018. Figure 42 Temporal statistics of methane climatology at LP by time and day of week (top panel), time of day (averaged over all days, bottom left), month of year (bottom middle), and day of week (bottom right) for the 2017–18 period. © University of Manchester, 2018. Repeating this analysis for CO2 (seen in Figure 43 and Figure 44), we see similar diurnal patterns in both baseline periods, again due to boundary layer ventilation. However, unlike the CH4 pattern, the diurnal variability is very similar for all wind directions. This is expected as the dairy farm is not expected be a source of CO2 in the local area. Also, a clear seasonal minimum is observed in August in NW and W wind directions. This feature is typical and expected to be due to the summer minimum in northern hemispheric CO2 concentration due to biospheric respiration (uptake), which peaks in the summer months. This is seen for all but easterly wind directions, simply because the relative change in the seasonal background CO2 concentration is significant when compared with the signal due to even very nearby CO2 emission sources, unlike CH4 (by virtue of the very small absolute mean global concentration of CH4 around 2 ppm, which means that small mass fluxes of CH4 can contribute a much greater relative signal on this much lower background). Figure 43 Temporal statistics of carbon dioxide climatology by time and day of week (top panel), time of day over all days (bottom left), month of year (bottom middle), and day of week (bottom right), averaged for the 2016–17 baseline period. © University of Manchester, 2018. 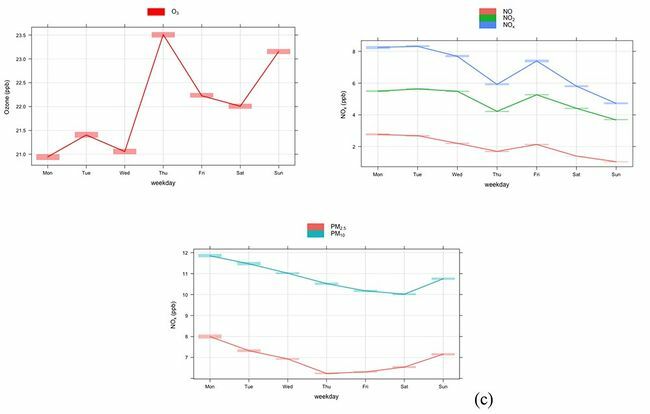 Figure 44 Temporal statistics of carbon dioxide climatology by time and day of week (top panel), time of day over all days (bottom left), month of year (bottom middle), and day of week (bottom right), averaged for the 2017–18 baseline period. © University of Manchester, 2018. The main sources of methane identified in the Phase 2 report (Ward et al, 2107) persist with the landfill at Fleetwood giving a consistent δ13C signature of -58 ± 1‰ (Table 7). Emissions were greatly reduced during the February 2018 survey when temperatures reached a minimum of -5°C and failed to go above 0°C during the daytime. Identified manure piles from previous surveys were still present, but with no identifiable emission above baseline during this survey. 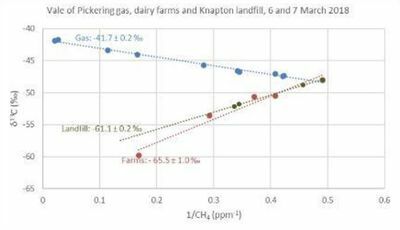 Figure 45 Keeling plot identifying the isotopic source signatures of gas leak and dairy farm methane emissions in the Fylde for samples collected on 27th and 28th February 2018. © RHUL, 2018. Table 7 Isotopic signatures of the main methane sources seen on each campaign in the Fylde. Gas leaks from the distribution network were identified, the most notable being at the entrance to Anna’s Lane (53.773°N 2.975°W), along Peel Road (53.767°N 2.972°W) and in the February 2018 survey only, along Preston New Road (53.786°N 2.956°W) near the LP site during pipe replacement activities. Additional leaks were located in the NE suburbs of St. Annes, including venting from a low-P junction installation. These leaks had consistent isotopic signatures of -41 ± 2‰ across the survey period (Figure 45 and Table 7). The isotopic signatures for agricultural sources varied across the seasons. Two end member compositions were defined: cow breath at -70 ± 2‰ and manure at -51 ± 2‰. Identified plumes of methane from ruminant husbandry had compositions between these two end members dependent on the activities taking place. Fields of cows with waste partly absorbed by the ground had signatures of -64 ± 2‰ during the summer months, whereas cow barns emitted methane with the full range of values. If cows were close to the sampling inlet the recorded signatures were closer to the -70‰ end member and if there was an empty barn with only waste product emitting the signature was closer to the -51‰ end member. Most isotopic signatures calculated for cow barn plumes were in the range -66 to -56‰ (Table 7) with some seasonal variation. January 2018 was most consistent with cows indoors at nearly all farms resulting in a common δ13C signature of -66‰. 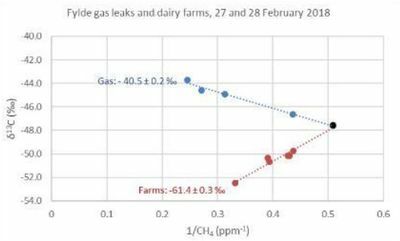 Plumpton Hall farm, 500m east of the Cuadrilla’s Preston New Road (PNR2) site, is a consistent emitter of methane from the cow barn with signatures of -66 to -59‰, and similarly Moss House Farm, 1 km NW of the PNR2 site, with signatures of -64 to -56‰. Figure 46 Location of the main methane emitting sources by category within the vicinity of the PNR2 well site. © RHUL, 2018. There was no detectable evidence of significant emissions to atmosphere from the PNR2 well that was being drilled during period covered by this report. The methane sources close to the PNR2 site discussed above are shown highlighted by source category on Figure 46, then shown in the aerial image with excess methane above baseline plotted for the campaign on 27 February 2018 on Figure 49. The prevailing winds could carry methane from gas leaks, bonfires and cow barns over the PNR2 site. Unless the sources are close enough to give >100 ppb excess methane, it is likely that ethane will be better than isotopes to distinguish between these sources at the continuous monitoring site. Examples of the GIS maps created to show methane excess over baseline along the survey routes are shown for 27 June 2017 (Figure 47) and 27 February 2018 (Figure 48). Figure 47 Excess methane mole fraction above baseline for the Fylde survey area, 27 June 2017. The baseline for each survey day is defined as the 2nd percentile of the data. © RHUL, 2018. Measurement of ethane during the more recent survey periods allows the calculation of methane:ethane ratios, which distinguish thermogenic from other gases by having low ratios, mostly <100. Presuming C3 and higher hydrocarbons are not significant components of the gas then this can be represented as a % of ethane in the gas. Consistency of ratios for each 1-second measurement interval within plumes improves with increasing excess over background to a point above 3 ppm excess CH4 when there is no observed reduction in the standard deviation of the ratio calculated. The instrument has only factory calibration to date and has not yet been finely calibrated for the high ethane contents measured of 0.1–10 ppm, but the current study is to identify differences between gas leaks and other sources and this is still valid. Figure 48 Excess methane mole fraction above baseline for the Fylde survey area, 27 February 2018. The baseline for each survey day is defined as the 2nd percentile of the data. © RHUL, 2018. Ratios of 17-20 (4.9–5.6% ethane, Table 7 and Figure 50) show close agreement for sources considered to be leaks from the national distribution grid within the Fylde area reinforcing the consistency of isotopic signal. This suggests that any new sources of thermogenic gas outwith the distribution network will be identifiable using δ13C and methane ethane ratios. A sampled bonfire plume had a ratio of 3 (25% ethane). Figure 49 Excess methane mole fraction above baseline for the area around the PNR2 well, Fylde, 27 February 2018 with identified methane sources labelled. The baseline for each survey day is defined as the 2nd percentile of the data. Note in particular methane elevations from dairy farms to the NW and E and gas measured on Preston New Road to the SW of the PNR2 site. (Basemap imagery sources: Esri, DigitalGlobe, GeoEye, Earthstar Geographics, CNES/Airbus DS, USDA, USGS, AeroGRID, IGN, and the GIS User Community). © RHUL, 2018.
identified during the Fylde 27–28 February 2018 mobile survey. Figure 50 Methane:ethane excess cross plots for fugitive gas emissions emissions identified during the Fylde February 2018 mobile survey. Left: 27th, Right: 28th. The multiplier of x is the ratio for the whole plume with CH4 excess >0.5 ppm. © RHUL, 2018. Time series of the data collected at the KM site over both baseline periods are shown in Figure 51. A general correlation between variability in CO2 and CH4 can be seen, consistent with that seen for the LP site across both periods. Figure 52 illustrates how the measured GHG concentrations relate to wind direction and wind speed. Unlike the LP site, Figure 54 illustrates that all wind directions occasionally display enhanced greenhouse gas concentrations relative to the background — a consistent feature across both years. There are clear periods of what can be defined as a ‘background’ (accounting for ~50% of the period) — where CO2 and CH4 concentrations appear relatively constant at around 400–420 parts per million (ppm) and 1.8–2 ppm, respectively (as seen in Figure 51 and Figure 54). These periods coincide with times of westerly winds seen, and as the orange and red colours in the top panels of Figure 54; and represent a typical seasonally-variant Northern Hemispheric average concentration for these greenhouse gases. There are prolonged periods (several consecutive days) of marginally enhanced CO2 and CH4 (between 410–450 ppm and 1.9–2.5 ppm, respectively. These periods coincide most often with moderate (0–4 m/s) south-easterly winds (see Figure 33), when comparing with Figure 53 and Figure 54 (where blue colours indicate easterly and south-easterly wind directions). These features are consistent with an interpretation that suggests that these episodes represent regional pollution inputs from continental Europe and the cities of Southern England, including London. There are short-lived (less than a few hours) but large enhancements (often referred to as ‘spikes’) in the time series data (greater than 2.5 ppm CH4 and 450 ppm CO2). These coincide most often with very light (0–2 m/s) easterly and south-easterly and northerly wind directions seen in Figure 53, compared with Figure 54 (where easterly winds are seen in blue colours). These features in the data, often superimposed on the more regional increment describe above, are expected to represent local (<10 km upwind) sources such as nearby. agricultural activities, roads, and landfill. It is notable that such transient enhancements at KM typically extend to lower maximal concentrations compared with the much larger enhancements seen at LP due to the increased presence of nearby agriculture and major roads at the LP site. For most of the time (>90% of the period), CO2 and CH4 display common patterns, in that both gases are often seen at their respective background concentrations, or are mutually enhanced with a scalable linear relationship (as shown in Figure 55 and discussed further below). Figure 51 Time series of carbon dioxide (red) and methane (green) in units of ppm measured at LP between: 1 Feb 2016 and 31 Jan 2017 (top panels); 1 Feb 2017–31 Jan 2018 (bottom panels). © University of Manchester, 2018. Interpreting this further, it can be seen that westerly wind directions typically (but not exclusively) bring relatively unpolluted (background concentration) air to the KM site. And, like LP, other wind directions deliver more complex airmasses likely comprising a wide mix of pollutant sources upwind, both local and regional, requiring additional interpretation (see below). Figure 52 Concentration (as per colour scale) wind rose for methane as measured at KM in the 2016–17 baseline period (left) and 2017–18 period (right). Radial extent contours define 2% frequency intervals. © University of Manchester, 2018. Figure 53 Concentration (as per colour scale) wind rose for carbon dioxide as measured at KM in the 2016–17 baseline period (left) and 2017–18 period (right). Radial extent contours define 2% frequency intervals. © University of Manchester, 2018. Figure 54 Concentrations (as per colour scale) in air as a function of time (x-axis) and wind direction (colour-coding) for carbon dioxide (top panels), and methane (bottom panels) as measured at KM for the 2016–17 baseline period (left panel) and 2017–18 period (right panel). © University of Manchester, 2018. Figure 55 Coincident CO2 and CH4 concentrations measured at KM for the 2016–17 period (left panel) and 2017–18 period (right panel). Colours indicate the frequency density of sampling (number of coincident measurements). Note: one count refers to a one-minute period of data. © University of Manchester, 2018. A dominant mixing line (traced by red and yellow colours) with a relationship of [CO2]=215.2[CH4]+386.5 ppm in 2016 and [CO2]=213.1[CH4]+389.6 ppm in 2017 — representing co-emission (or bulk mixing) of nearby CO2 and CH4 sources upwind to the east and south east (based on understanding of how such concentrations relate to wind direction in Figure 54). The gradient at KM is almost twice that seen at LP (Figure 38) suggesting that CO2 sources dominate the relative mix of these two gases in airmasses received at KM (compared to LP). A number of clear (but very infrequent) CH4 excursions (seen as the blue horizontal lines in Figure 55 in both the left and right panels) to relatively high ambient concentrations of up to 10 ppm (>5 times background), where very little change in CO2 concentration is observed. However, these features represent only 635 minutes of sampling (~6.5 hours) in 2016 and ~10 hours in 2017; and are noted to occur mostly in the spring months in light south-southeasterly wind conditions (see Figure 54). 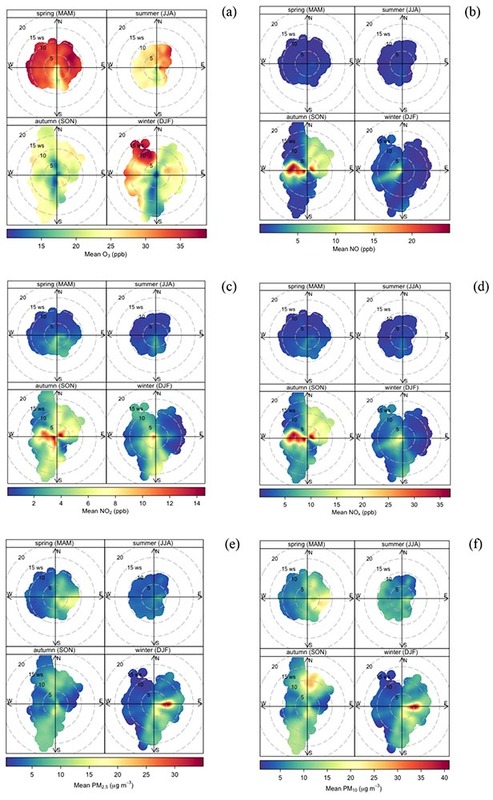 These features are consistent with a methane-only (highly localised) source, associated with wind directions from ~200 degrees (southsouthwesterly — see Figure 54). Given that the existing Third Energy well-head is positioned ~100 m upwind from the measurement site in this direction, we suggest that these enhancements may well represent detection of fugitive emissions of CH4 from the existing conventional gas extraction site, which appear to be a continuous feature across both baseline periods. A dominant red cluster centred at ~400 ppm CO2 and 2 ppm CH4 — this represents the dominant and frequent background signal seen in westerly Atlantic airmasses (Figure 52 and Figure 53). Note that this dominant background cluster corresponds to >210 total days of measurement in both baseline periods. The dominant mixing line seen in Figure 55 corresponds to frequent easterly and south-easterly wind directions. Considering the location of KM, these wind directions represent air that has passed over continental Europe and the cities of southern England, respectively (including London). As discussed earlier for LP, while cities and infrastructure are a principal source of UK pollution (including greenhouse gases), biogenic sources of greenhouse gases, such as the biosphere, landfill and agriculture would also be expected to feature in the fetch of such airmasses when upwind of the KM site. To interpret more local sources of pollution (within ~10 km), we focus on the more transient features in the high temporal resolution dataset. To do this on an event-by-event basis for a year of data would be meaningless (and impractical) in the context of the baseline analysis here, though event-led (case study) analysis may well be advisable during any operational monitoring, especially given the observation of potential fugitive emissions at the existing Third Energy site concerning CH4 discussed in point 2 above. Figure 56 Polar bivariate representation of carbon dioxide (top panels) and methane (bottom panels) as a function of wind direction for the 2016–17 period (left panels) and 2017–18 period (right panels) sampled at KM. The colour scale represents the fraction of total measurement time weighted for concentration enhancement relative to the global mean (as scaled for colour in units of ppm) and wind speed (defined by the radial component — each radial increment representing 5 m/s). © University of Manchester, 2018. Figure 56 illustrates a polar bivariate representation of the relationship between both wind speed and direction and greenhouse gas concentration in both baseline periods. The colour scale in Figure 56 highlights the wind speed and wind direction conditions that dominate the overall concentration average seen at the measurement site (as a weighted mean of concentration x frequency of occurrence). The red areas seen in both panels (CO2 and CH4) in Figure 56 correspond to light winds (0–2 m/s) from the south west indicating a well-constrained local source for both gases (suggested to be the existing well-head at the Third Energy site). Figure 56 also shows how the absolute measured concentration relates to wind direction and wind speed, which again shows the dominant southerly, south-easterly and south-westerly origin of more elevated CH4 and CO2 concentrations. The fact that the red area does not extend to higher wind speeds in the southwest is consistent with an interpretation that longer range sources of pollution may not contribute significantly to periods where the greatest enhancements in concentrations are sampled at the site, i.e. that local source(s) dominate the strongest enhancements, especially in the case of CH4. The role of longer range (regional, national and continental) sources (mainly to the southeast) is therefore to add a smaller increment to the much larger local emission source(s) to the southwest that dominate periods of enhancement in southerly wind conditions. The lighter blue areas seen in Figure 56 in both periods, to the west, indicate a long range and diffuse source of the greenhouse gases, which is consistent with longer range transport of moderately enhanced airmasses, from the fetch to the west, which would include northern UK cities and the Pennines as well as potential longer range emissions from Ireland and in intercontinental transport from the United Stated, although this source’s relative contribution to the baseline is very much weaker than those upwind sources when airmasses are received from the south east. In other words, the westerly airmass at KM can be characterised as being broadly similar to the clean westerly airmass seen at LP but with the addition of UK sources over land between the two sites such as the cities of Manchester, Leeds and Sheffield (as well as expected smaller contributions from biogenic emissions over the Pennines such as peat). 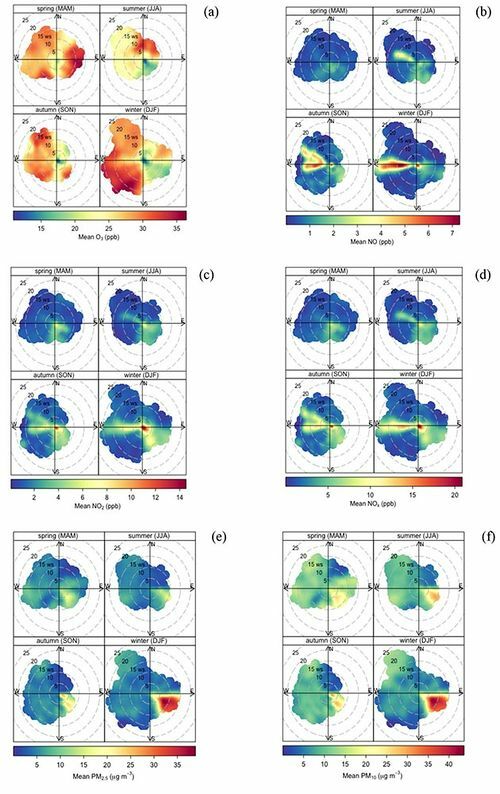 To differentiate further the role of local, regional and more distant (long range inter-continental) pollution sources, we again examine the airmass history, which can be interpreted using Hysplit Lagrangian back trajectories over the previous 5 days with endpoints at the location of the KM site at 6-hourly intervals across both baseline periods. Figure 57 shows the airmass history of air sampled at KM for both baseline periods. This statistical representation of the history of air should be interpreted as a surface ‘footprint’, illustrating a surface area over which air measured at KM has been influenced by potential surface sources. Figure 57 shows the frequency (as a fraction of total time, in this case as a percentage of each 12-month baseline period) that air has passed near to the surface in a latitude-longitude grid with a 1-degree or 0.25-degree spacing for the Atlantic (left panels) and UK (right panels) regions, respectively. The orange and red colours in Figure 57 indicate that air received at KM is most characterised by air that has previously passed over North West England and Wales in both baseline periods, while the light blue and green colours show that a larger area over northern England in general contributes to the annualised footprint, with wider-scale contact with Atlantic and Arctic Ocean and western and northern continental Europe (blue colours). We can now examine the temporal patterns associated with measured concentrations. The diurnal, weekly, and seasonal variability observed for different wind directions can give additional clues as to the nature of sources and their proximity to the receptor site. Figure 58 and Figure 59 show the temporal statistics for methane in each baseline period. 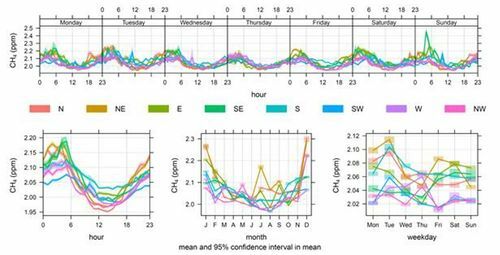 The top panels show the mean diurnal pattern and statistical variability (at the 95% confidence level of sampled variability around the calculated mean) in methane concentration as a function of time of day (and day of week) and coloured according to wind direction. When illustrated in this way, we can clearly observe highly consistent diurnal behaviour for CH4 in all wind directions and across both baseline periods. In particular, we see a consistent and repeatable diurnal minimum at around 2 pm on every day of the week across the whole year in both years. We also see a marked increase in winter months for Cluster 2 (centre bottom panels). A similar diurnal and seasonal pattern was seen for LP and linked to local (<10 km) sources. Such a pattern is consistent with the diurnal ventilation of the local boundary layer, as the height of the planetary boundary layer is lifted by convection in daylight hours (enhanced in summer months relative to winter due to solar heating), further indicating a dominant role for local sources, which might be expected to accumulate overnight before being diluted and detrained in daylight hours. 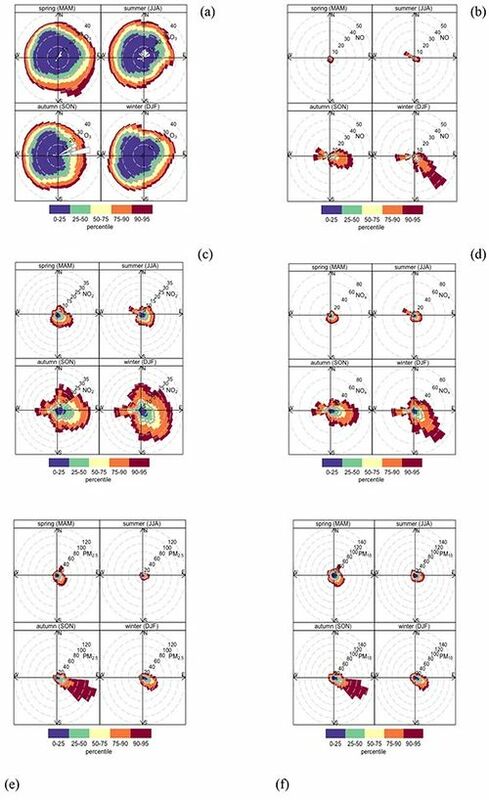 Figure 57 5-day airmass history surface Lagrangian trajectory footprint statistics for the period 1 Feb 2016 to 31 Jan 2017 (top panels), and 1 Feb 2017 to 31 Jan 2018 (bottom panels) as seen from the KM site at a spatial resolution of 1 x 1 degree (Atlantic region — left panels) and 0.25 x 0.25-degree resolution (right panels). Frequency refers to the fraction of the total trajectories passing over each lat/long grid cell. © University of Manchester, 2018. There is no statistically significant signal separating days of week from the weekend across both baseline periods. A curious peak at 5 am on Sundays seen in the 2016 period is absent in the 2017 period and the early morning and late evening peaks seen on Fridays in 2017 are not consistently observed in the 2016 period. Figure 58 Temporal statistics (for the 2016–17 baseline period) of the methane climatology at KM by time and day of week (top panel), time of day over all days (bottom left), month of year (bottom middle), and day of week (bottom right). © University of Manchester, 2018. Figure 59 Temporal statistics (for the 2017–18 baseline period) of the methane climatology at KM by time and day of week (top panel), time of day over all days (bottom left), month of year (bottom middle), and day of week (bottom right). © University of Manchester, 2018. Repeating this analysis for CO2 (seen in Figure 60 and Figure 61), we see very similar diurnal patterns due to boundary layer ventilation (top panels) across both baseline periods. However, unlike methane, a clear seasonal minimum is observed in summer months (JJA) for all wind directions except during northeasterly (both years) and northwesterly (2016–17 only). This general feature (consistent with that seen at LP) is typical and expected to be due to the summer minimum in northern hemispheric CO2 concentration due to biospheric respiration (uptake), which peaks in the summer months in the Northern Hemisphere. This is seen for most wind directions simply because the relative change in the seasonal background CO2 concentration is significant when compared with the signal due to even very nearby CO2 emission sources, unlike CH4 by virtue of the very small absolute mean global concentration of CH4 around 2 ppm, which means that small mass fluxes of CH4 can contribute a much greater relative signal on this much lower background. The source(s) of higher CO2 concentrations observed in summer months associated with northeasterly winds remains unexplained but appears to be dominated by sampling during the hours between midnight and 6 am (UT) seen in the top panel of Figures 41 and 42, with higher average concentrations on Mondays and Tuesdays (lower right panels). Figure 60 Temporal statistics (for the 2016–17 baseline period) of the carbon dioxide climatology at KM by time and day of week (top panel), time of day over all days (bottom left), month of year (bottom middle), and day of week (bottom right). © University of Manchester, 2018. Figure 61 Temporal statistics (for the 2017–18 baseline period) of the carbon dioxide climatology at KM by time and day of week (top panel), time of day over all days (bottom left), month of year (bottom middle), and day of week (bottom right). © University of Manchester, 2018. The peak in night-time hours is explained by reduced boundary layer ventilation of already-enhanced daytime concentrations during hours of darkness. However the reasons for enhancement on Mondays and Tuesdays is less easily explained. The back trajectories (airmass histories) associated with such wind directions have a European continental origin (up to 5 days prior to measurement), perhaps suggestive of long range transport from combustion sources in western Europe, which may be more active over weekend days. Alternatively, the enhancement may be due to increased local traffic on Mondays and Tuesdays from areas to the north east of the measurement site. However, this cannot be confirmed without case study analysis, beyond the scope of this work, and the ultimate sources of CO2 contributing to this observation cannot be explicitly ascertained. 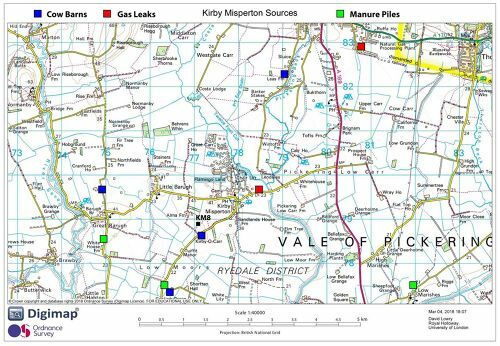 Figure 62 Keeling plot to identify methane δ13C signature of gas leaks, dairy farms and Knapton landfill site in the Vale of Pickering, 6–7 March 2018. © RHUL, 2018. 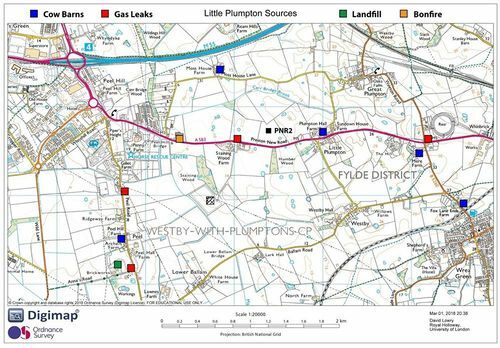 The main sources of methane identified in the Phase 2 report (Ward et al, 2017) persist with the landfill at Knapton giving a consistent δ13C signature of -60 ± 2‰ and the Caulklands landfill at Thornton-le-Dale giving -58 ± 1‰ when the wind was appropriate for plume intersection (Table 3). The isotopic signatures of methane from the main sources encountered on 6th and 7th March are identified in Figure 62.
on each campaign to the Vale of Pickering. 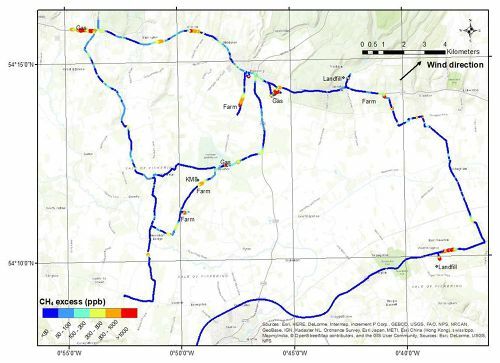 The fugitive emissions from the Pickering gas offtake station, 5.5 km to the NE of KM8, have been significant throughout the project with a consistent isotopic signature of -42 ± 2‰ for up to 30 ppm CH4 adjacent to the site and up to 10 ppm CH4 measured across the neighbouring industrial estate to the NE. 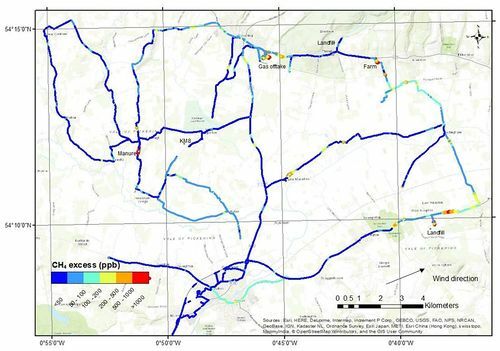 In this phase of the project (Phase 3), other gas leaks have been located; one in a small layby on the road 0.5 km ENE of Kirby Misperton village, only detected in favourable atmospheric conditions; and 3 leaks along the A170 from Keldholme to Catter Bridge, the largest being from the culvert beneath the road at the entrance to Ox Close (54.264°N, 0.905°W), 9 km to the NW of KM8, with 120 ppm CH4 recorded from the vehicle roof inlet and distinct odours present. These have persisted throughout mobile surveying carried between June 2017 and March 2018, with a δ13C signature of -42 ± 3‰. Figure 63 Location of the main methane emitting sources by category within the vicinity of the KM8 well site. © RHUL, 2018. As in the Fylde region the isotopic signatures for agricultural sources varied across the seasons between the ruminant breath (-71‰) and waste (manure piles, -50‰) end members. The farm at Kirby-o-Carr, opposite the track entrance to KM8 emits methane from the cow barn, but the prevailing westerly winds during the Phase 3 campaigns resulted in a dispersed plume being detected only during the March 2018 campaign and reaching Kirby Misperton village. Further afield, 1.5 km SW of KM8, a 3 m high manure pile was located at the Blansby Lane intersection during summer months, with the nearby cow barn (54.187°N, 0.830°W) being a regular emitter of CH4 plumes. The largest barn plumes were measured from Leas Farm 1.5 km SW of Pickering. While a range of cow barn signatures from -71 to -56 ‰ have been measured during phase 3, the mean signature recorded is -66 ± 2‰. This is depleted compared to the Fylde region, but may indicate a better separation of the waste sources from animal groups. Figure 64 Excess methane mole fraction above baseline for the Vale of Pickering survey area, 26 October 2017. The baseline for each survey day is defined as the average of the 2nd percentile of the data. © RHUL, 2018. No distinct evidence of significant methane emission from the location of the KM8 well was seen on any of the campaign days in the Vale of Pickering. The methane sources close to the KM8 site discussed above are shown highlighted by source category on Figure 63, then shown in the aerial image giving rise to methane mole fractions >500 ppb above the baseline for the campaign on 6 March 2018 as seen on Figure 66. The prevailing winds will carry CH4 with a depleted isotopic signature over the KM8 site. Only during NE–E winds is there a possibility of isotopically-enriched CH4 from the gas leak being detected on site. Examples of the GIS maps created to show methane excess over baseline along the survey routes are shown for 26 October 2017 (Figure 64) and 6 March 2018 (Figure 65). The larger fugitive natural gas sources in the Vale of Pickering have proven to be a good test of the methane-ethane instrument. Despite the isotopic signatures of natural gas in both the Fylde and the Vale of Pickering falling into the δ13C range of -41 ± 2‰, there is a significant separation in methane:ethane ratios, being lower at 11–14 in the KM region (Table 10), and therefore having higher ethane at 6.7–8.2‰. A vehicle exhaust emission sampled near the centre of Pickering had a ratio of 1.5 (40% ethane) (Figure 67). This distinction between ratios of regional gas and combustion sources, suggests that any emissions to atmosphere from shale gas operations could be identifiable using this method. Figure 65 Excess methane mole fraction above baseline for the Vale of Pickering survey area, 6 March 2018. The baseline for each survey day is defined as the average of the 2nd percentile of the data. © RHUL, 2018. Figure 66 Excess methane mole fraction above baseline for the area around the KM8 well, Vale of Pickering, 06 March 2018. The baseline for each survey day is defined as the average of the 2nd percentile of the data. Note methane elevations from dairy farms to the S and SSW and a gas leak to the ENE of the KM8 site. (Basemap imagery sources: Esri, DigitalGlobe, GeoEye, Earthstar Geographics, CNES/Airbus DS, USDA, USGS, AeroGRID, IGN, and the GIS User Community). © RHUL, 2018.
identified during the Vale of Pickering 6–7 March 2018 mobile survey. Figure 67 Methane:ethane excess cross plot for fugitive gas emissions identified during the Vale of Pickering March 2018 mobile surveys. Left: 6th, Right: 7th. The multiplier of x is the ratio for the whole plume with CH4 excess >0.5 ppm, except for the vehicle emission, which is >0.05 ppm. © RHUL, 2018. A summary of the baseline statistical climatology for both sites and for both annual periods is presented in Table 11 and Table 12. We first discuss this climatology for each site separately, before comparing features between both sites. There are clear periods of what can be defined as a ‘background’ (accounting for 50%–60% of the time over both the 2016 and 2017 periods). Background conditions can be conceptualised as conditions where CO2 and CH4 concentrations are around 400 parts per million (ppm) and 2 ppm, respectively. These background conditions coincide strongly and exclusively with winds from a direction between 190 and 350 degrees (i.e. from western quadrants), and represent a typical (but seasonally-variant) Northern Hemisphere average concentration. There are prolonged periods (several consecutive days) of marginally enhanced CO2 and CH4 between 400–450 ppm and 2–4 ppm, respectively, in both baseline periods. These periods coincide most often with moderate south-easterly or easterly winds. These features are consistent year-on-year, with an interpretation suggesting that these episodes represent regional pollution inputs from cities to the south and east such as Manchester, and the cities of Central and Southern England. There are short-lived (less than a few hours) but large enhancements (often referred to as ‘spikes’ or ‘transients’) in the time series data, characterised by measured concentrations greater than 4 ppm CH4 and 500 ppm CO2). These coincide most often with light easterly and south-easterly and northerly wind directions. These short-lived features in the data, often superimposed on a broader regional increment (enhancement) as described above, are strongly expected to represent local (<10 km upwind) sources such as nearby agricultural activities, roads, and landfill, with the dominant nearby source of methane being a dairy farm 1km to the east of the Cuadrilla site, and, in the case of carbon dioxide, the Preston New Road main road immediately to the south. For most of the time (>90% of both periods), CO2 and CH4 display common (correlated) patterns, in that both gases are often seen at their respective background concentrations, or are mutually enhanced with a scalable linear relationship. This suggests that most pollution arriving is contained within well-mixed regional airmasses with a mix of common greenhouse gas sources. However, the least frequent, but greatest enhancements, in greenhouse gases are independent of each other and represent a sole (strong and local) source, in this case the dairy farm and Preston New Road traffic emissions. The climatological annualised GHG statistics for the LP site are given in Table 5 in the following Section, which presents a statistical comparison for both greenhouse gases at both sites and over both baseline periods. The mean concentrations of CO2 and CH4 are slightly elevated (4.5% in the case of CO2, and 18.4% for CH4) compared with the Northern Hemispheric tropospheric average for 2016 (~400 ppm and ~1850 ppb, respectively), with very similar enhancements (4.1% and 11.6%, respectively) in 2017. This is expected due to the position of LP on land and exposed to sources of emission both locally and regionally. The one-standard-deviation variability around the mean is large but highly consistent across both periods: 4.8% for CO2 and 29.5% for CH4 in 2016, and 3.8% and 18.5%, respectively, in 2017. The large variability around the mean reflects the variable airmasses that impact the site, while the consistency in variability year-to-year reflects the highly similar overall wind climatology reflected in the back trajectory footprint analysis. The higher CH4 variability is expected to be linked to the more variable nature of local sources (such as agriculture and landfill identified in the mobile surveys). Such sources vary with time and respond to environmental conditions such as temperature, soil moisture and pressure. The interquartile and interdecile ranges for both gases are constrained to 6.5% for CO2 and 17% for CH4 relative to the mean, while the extrema (99th percentiles), extend to 16% and 215% of the mean for CO2 and CH4, respectively. This demonstrates that for the vast majority of both baseline periods (80%), concentrations do not vary by more than ~20% at most). However, shorter period, extreme events (accounting for 1% of each baseline period), can see concentrations of CH4 double that of the mean climatological concentration. Such periods are identified with episodic local emissions, lasting for a few hours at most, and appear to be linked predominantly to the nearby dairy farm. There are clear periods of what can be defined as a ‘background’ (accounting for between 40%–55% of the sampling time across both periods) — where CO2 and CH4 concentrations are around 400–420 parts per million (ppm) and 1.8-2 ppm, respectively. These periods coincide mostly with periods of westerly quadrant winds; and represent a typical (but seasonally-variant) Northern Hemispheric average concentration for these greenhouse gases. There are prolonged periods (several consecutive days) of marginally enhanced CO2 and CH4 between 410–450 ppm and 1.9–2.5 ppm, respectively. These periods coincide most often with moderate (0–4 m/s) south-easterly or southerly winds. These features are consistent with an interpretation that suggests that these episodes represent regional pollution inputs from continental Europe and the cities of Southern and Central England, including London. There are short-lived (less than a few hours) but large enhancements (often referred to as ‘spikes’ or ‘transients’) in the time series data in both periods with similar frequency (greater than 2.5 ppm CH4 and 450 ppm CO2). These coincide most often with very light (0–2 m/s) easterly and south-easterly and northerly wind directions. These features in the data, often superimposed on the more regional increment describe above, are expected to represent local (<10 km upwind) sources such as nearby agricultural activities, roads, and landfill. 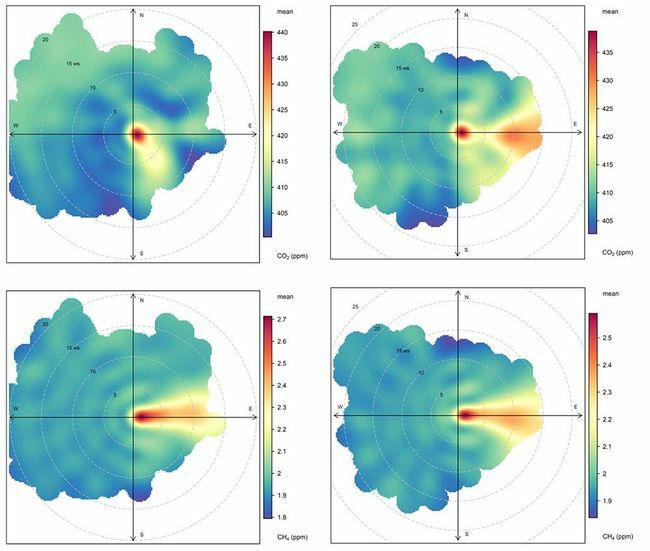 It is notable that such transient enhancements in CH4 at KM typically extend to lower maximal concentrations compared with the much larger enhancements seen at LP due to the increased presence of nearby agricultural activity and major roads at the LP site. For most of the time (>90% of the period), CO2 and CH4 display common (correlated) patterns, in that both gases are often seen at their respective background concentrations, or are mutually enhanced with a scalable linear relationship. 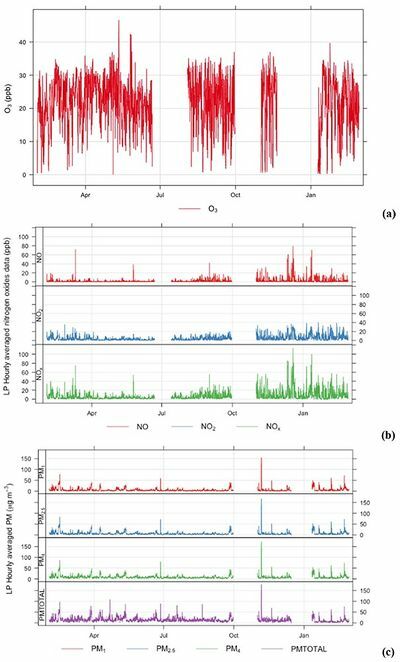 However, infrequent periods of strong CH4 enhancement, which were not coincident with CO2 enhancement, were observed at KM suggesting the presence of a non-combusted (fugitive) methane source in the local area. The climatological annualised GHG statistics for the KM site are given in Table 11. The mean concentrations of CO2 and CH4 are very slightly elevated: 5.2% in the case of CO2, and 11.4% for CH4, in 2016, and 5.1% and 7.2%, respectively, in 2017, when compared with the Northern Hemispheric tropospheric average for each year. This mean enhancement is expected due to the position of KM on land and exposed to sources of emission both locally and regionally. We note that this mean baseline is lower than that of the LP site in terms of GHGs. The one-standard-deviation variability around the mean is smaller than LP (at 5.8% for CO2 and 9.3% for CH4 in 2016, and 5.8% and 10.8%, respectively, in 2017). However, there is no detectable change in the sampled variability year-to-year. The higher CH4 variability (compared with CO2) is suggested to be linked to the nature of local sources, such as thermogenic fugitive emission suggested in the analysis of the mobile surveys. The interquartile and interdecile ranges for both gases are constrained to 3.4% for CO2 and 6.8% for CH4 relative to the mean, while the extrema (99th percentiles), extend to 22.6% and 34.0% of the mean for CO2 and CH4, respectively. This extreme variability at KM is far smaller than the equivalent statistics for LP (Little Plumpton — greenhouse gas summary). This demonstrates that for the vast majority of the period (95%), concentrations do not vary by more than ~20% relative the mean for both these greenhouse gases at most). However, shorter period, extreme events (accounting for 0.1% of the baseline period), can see concentrations of up to ten times CH4 relative to the mean climatological concentration. Such periods are identified with episodic local emissions, lasting for a few hours at most as discussed earlier, and associated with south-westerly wind conditions. These episodic features are worthy of further case study attention during any operational phase and may represent a local fugitive emission source, such as the existing Third Energy conventional gas site and well-head. Table 11 Summary climatological statistics evaluated over the baseline period for carbon dioxide concentrations measured at the baseline site at both the LP and KM sites over both baseline periods. Comparing data from both measurement sites offers insight into the potential transferability of baseline datasets. In this section, we briefly compare the measurements at each site in the baseline period. In our Phase 2 report (Ward et al, 2017), and in Results of this report, we examined the data from both sites separately. It was seen that there are many periods where CO2 is simultaneously enhanced at both sites, occasionally with a short lag of a few hours between transient features. However, there are notable times when this is not the case, or when one site appears to lag the other by up to a day or two. Such lag patterns reflect the advection of airmasses across the UK and also indicate that both sites often sample similarly polluted airmasses in terms of CO2. However, the picture is much more complicated for CH4. While some peaks in CH4 are observed at similar times at both sites, the magnitude of the enhancement compared with the ~2 ppm background is markedly different. Many such periods coincide with light easterly winds at the LP site, and with southerly quadrant wind directions at the KM site. It is interesting to note that LP is broadly upwind of KM in a prevailing north-easterly wind regime and that the enhancements seen at LP might be expected to represent sources of methane in the fetch between the two sites. However, for the largest enhancements in methane especially (at both sites), the wind direction does not connect the two sites, strongly suggesting a dominant role for more local sources of methane gas. In the LP case, this source is dominated by the nearby dairy farm, whereas at KM, the local source remains unidentified and worthy of further study. The wind direction for infrequent but strong deviations from baseline at KM does connect with existing onsite infrastructure. However, the mobile surveys have also identified other strong localised sources such as other natural gas infrastructure and pipelines in the area upwind on such occasions. Additional measurements immediately upwind of the KM Third Energy site (beyond the fenceline) would be needed to isolate and deconvolve on-site emissions from other local sources that may be contributing to such episodes and this should be a focus of future case study work in potential operational phases. Table 12 Summary climatological statistics evaluated over the baseline period for methane concentrations measured at both sites over both baseline periods. © University of Manchester, 2018. Both regions show strong similarities of sources within the environs of the drilling sites with sources being dominated by cow barns, gas leaks and a smaller number of manure piles. There are more sources in the LP region than the KM region, but the gas leaks in the Vale of Pickering are bigger emitters than those in west Fylde. The isotopic characterisation of the sources in both regions are strongly comparable with generally tight clustering of signatures for the main sources at -58‰ for landfills, -50‰ for manure piles and -41‰ for gas leaks. Only the ruminant animal husbandry shows a greater spread of values in both region depending on proportions of breathing animals to waste product and their location in barns or dispersed in fields, so this has a seasonal variability. The landfill and animal signatures are consistent with those observed in other areas of the UK, whereas the gas from these regions of northern England are depleted compared to signatures observed in SE England of -36 ± 1‰ (Zazzeri et al., 2017), a feature that is undergoing further investigation. The most significant difference between regions identified to date is in the methane:ethane ratio of the distributed gas in each region, being in the range 11–14 in the Vale of Pickering and 17–20 in the Fylde. As this is new instrumentation there are currently few measurements of gas leak sources from outside of northern England for comparison. surveys between the two regions. As raised in our Phase 2 report, the differences between the two sites, especially in terms of CH4, illustrate the need for local baseline (and directly analogous operational) monitoring. A baseline at one location is clearly not applicable as a set of useful comparable (or contextual) statistics at any other location. However, the consistency of the baseline (and baseline variability within each year) at each site separately does clearly suggest that 12 months of baseline monitoring is sufficient to establish a meaningful climatology from which to compare with analogous climatologies within the operational lifetime of onshore unconventional oil and gas well sites. 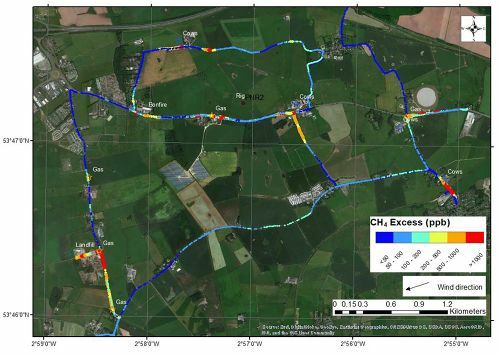 We recommend that a minimum of 12 months of baseline monitoring is sufficient for future site characterisation concerning greenhouse gases where sites are in rural/semi-rural locations. However, in urban areas, or areas where there are multiple local extraneous and transient sources of gas, a longer period of monitoring might be required. The method of airmass clustering is werful in differentiating the role of local and long-range sources, and the airmass history and meteorological analysis here clearly shows that local (<10 km) sources dominate the contribution to statistically elevated concentration observations. In the case of LP, an absence of significant upwind GHG sources to the west, makes future observations from this wind direction especially useful for characterising future fugitive emission linked to shale gas operations in that area. However, existing signals in the baseline at KM may complicate this, requiring us to isolate specific periods (and airmass histories) in the baseline to provide the correct baseline comparison statistics. In all cases, it must be stressed that the levels of greenhouse gas concentrations seen at the two sites do not represent any known hazard to human health and are well within the typical range seen for any rural or semi-rural land-based measurement site. Even the largest transient enhancements seen in the collected dataset are in what would be considered to be a normal modern (post-industrial) range and the conclusions drawn in this report on the existing sources of local pollution do not represent any cause for local alarm in this author’s opinion. The background (hemispheric average concentrations) seen in airmasses associated with westerly and south-westerly origins lend themselves optimally to assessment of any incremental signal due to shale gas operations in Little Plumpton. This is because the location of the baseline site is directly to the east of the Cuadrilla’s Preston New Road shale gas site, which means that any significant fugitive emission should be readily observable against the otherwise uniform and clean signal seen for this wind direction in the baseline dataset. This will allow future work to positively identify (but not quantify mass flux for) the source of emissions on site as a function of time, linking such emissions (should they exist) to site activity and phases of production. The observed statistics concerning pre-existing sources of nearby and regional pollution allow any shale-gas-linked emission (in future, should analogous data be collected for comparison) to be compared numerically with concentration statistics in the baseline for other (more elevated pre-existing) wind directions and emission source origins. This allows for a contextual comparison – where any localised elevations due to shale gas can be quantified statistically, as a fraction of the contribution to atmospheric composition due to non-local emission sources. The consistency of the baseline across both annual periods strongly reinforces this conclusion and validates the statistical climatology as a useful set of data from which to compare the impact of any future activity. To summarise, the purpose of this analysis was to establish and validate the baseline climatology for the LP and KM sites to allow future comparative interpretation. In the context of greenhouse gases, this concerns the future quantification of greenhouse gas mass flux to atmosphere (fugitive emissions) from shale gas operations. The consistency of the baseline statistics year-to-year at each site separately, strongly validates the utility of these statistics in future comparative work. 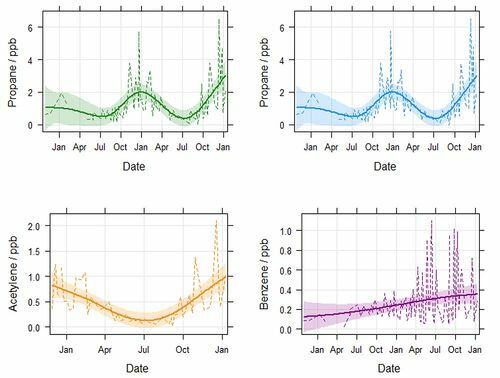 The remarkable repeatability and similarity in both mean and statistical variability at each individual site across both annual periods suggests that 12 months of monitoring is sufficient to usefully characterise the baseline at future sites. The large differences between the baselines at both sites, due to influence of local sources, demonstrate that careful thought and further work may be required to assess the spatial scale over which baselines can be usefully applicable. 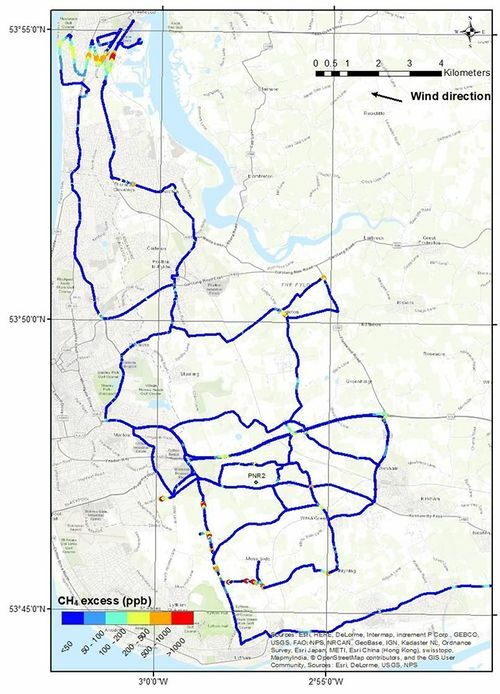 The current baselines are internally consistent for the LP and KM sites but may not be extrapolated to future sites proposed in different towns or council areas for example. Further modelling work, or the collection and analysis of future site-specific baseline datasets may be required to understand this. However, monitoring needs should be decided in the context of their use, e.g. for receptor exposure to air pollution, or in the quantification of GHG emissions. This section reports the Air Quality (AQ) dataset for both the KM and LP measurement sites. The statistical analysis of the AQ dataset for both sites is presented and interpreted in the context of sources of emissions using meteorological data to aid analysis. 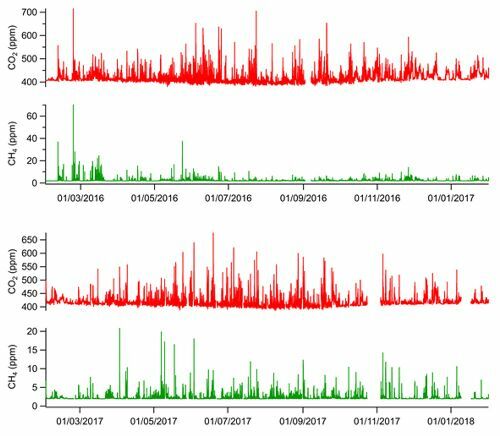 The analysis provides information on the annual climatology of air pollution at both locations along with representative insight into shorter-term variability in air pollution. The baseline analysis is framed specifically with reference to the attainment of European Commission (EC) Directive air quality standards at both locations. This uses a range of metrics including annual, 1 hour and 8 hour mean concentrations. For KM there was a change from baseline monitoring to pre-operational monitoring on the 19th September 2017 when equipment started to be brought on to site in readiness for hydraulic fracturing operations. The dataset used in this report was collected using surface monitors located at KM and LP and covers the observation period from 1 February 2017 until 28 February 2018. However as identified above the data at KM from the 19th September 2017 will not be considered as baseline but are referred to as ‘pre-operational’. The dataset includes local meteorology (2 m above ground), nitrogen oxides (NO and NO2, collectively NOx), particulate matter (PM) in a number of aerodynamic size ranges, ozone (O3), speciated non methane hydrocarbons (NMHCs) and from 2017 hydrogen sulphide (H2S) and sulphur dioxide (SO2). The data are archived and publically accessible at the NERC Centre for Environmental Data Analysis (CEDA). Measurements are available at 1 minute intervals, except NMHCs which are reported as weekly values, see: http://browse.ceda.ac.uk/browse/badc/env-baseline. The environment baseline is firstly examined on a site by site basis followed by comparison of the climatologies of pollution at each site and then to other regional UK monitoring sites operated by Defra and other agencies. Managing and improving air quality in the UK is driven by European (EU) legislation on ambient air quality standards and also commitments to limit transboundary emissions, through the National Emissions Ceiling Directive and the Gothenburg protocol. The 2008 ambient air quality directive (2008/50/EC) sets legally binding limits for outdoor air pollutants that impact on human health and includes NO2, O3, benzene, 1, 3 butadiene, PM10 and PM2.5. All these species have been measured as part of the baseline project. Within the UK, ambient air quality is controlled with the aspiration that all locations meet either the prescribed Limit Values or Target Values depending on the species. EU Limit values are legally binding concentrations that must not be exceeded. There are prescribed averaging times associated with each pollutant and for some pollutants a number of exceedances are allowed in each year. Target values are meant to be attained where possible by taking all necessary measures not entailing disproportionate costs, often reflecting natural impacts on those pollutants that can lie outside of regulatory controls. All EU directive standards are listed here: http://ec.europa.eu/environment/air/quality/standards.htm. The UK air quality objectives for data parameters measured as part of the air quality baseline are shown in Table 14. Table 14 UK National air quality objectives. Table 15 shows a summary of the annual means of the measured air pollutants at both KM and LP. An important observation is that, over the period of measurement, there were no exceedances of annual mean limit values. For planning and development purposes, air quality issues must be taken into account when ambient air pollution concentrations approach 75% of the limit values. No air pollutants at either site reached this threshold. air pollutants and comparison against annual mean limit values. UK national air quality limits. Exceedances for the period of monitoring covered by this report (Phase 3) are shown in Table 16. Within this measurement period there were no O3 or NO2 exceedances at either site. The 24 hour mean limit value for PM10 was exceeded on 13–14th February, 2017 at KM and 14th Feb at LP. As this was observed at both sites it is likely that this was a UK-wide episode similar to that which occurred in March 2016 and was reported in the Phase 2 report (Ward et al, 2017). Other Automated Urban and Rural Network (AURN) monitoring sites run by DEFRA (Department for Environment, Food and Rural Affairs) show similar values on both the 13th and 14th February, 2017. These data can be viewed at https://uk-air.defra.gov.uk/data/. The second exceedance at LP was on the 6th November 2017 coinciding with Bonfire Night, the previous evening. Multiple open fires and fireworks result in a build-up of particulate matter in the air. The annual mean values for air pollution allow for comparison against national targets. 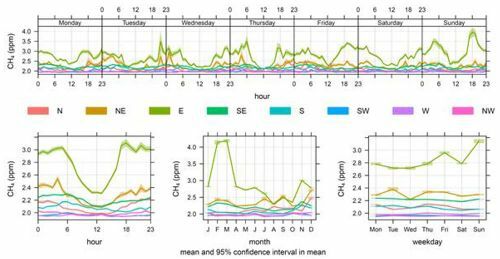 NOx, O3, PM and meteorological data have all been collected at 1 minute time resolution and this is advantageous for data analysis as a more detailed climatology of air pollution can be constructed at the local scale. The hourly average time-series for parameters measured at both sites are shown in Figure 68 and Figure 69 but these tend to only show synoptic/seasonal scale variability. As in the previous report higher O3 is seen in the spring/early summer at both sites, typical for the UK. Due to instrument problems some of the summer data are missing but there do not appear to be many photochemical O3 production events, a result of a generally cool summer in the UK in 2017. The difference in the O3 measurements at the two sites is notable from Oct 2017 where O3 decreased at KM and not at LP. This correlates with periods of higher NOx being observed at KM. The NOx spikes are correlated with lower O3, which is related to atmospheric chemistry. This was highlighted in the previous report but is more noticeable in the data set reported here. In the immediate vicinity of high NO emission, O3 is lost via Reaction 1 (see below), resulting in local O3 depletion and the production of NO2. Figure 68 Annual hourly time series at the KM site for (a) O3, (b) NO, NO2, NOx (c) PM1, PM2.5, PM4, PM10 and PMTotal between February 2017 and February 2018 © University of York, 2018. Figure 69 Annual hourly time series at the LP site for (a) O3, (b) NO, NO2, NOx (c) PM1, PM2.5, PM4, PM10 and PMTotal between February 2017 and February 2018 © University of York, 2018. An increase in NOx at KM (Figure 68) after September 2017 is evident and will be discussed futher later in the report. There also appears to be an increase at LP (Figure 69), but this has not been discussed as at time at report authors will still awaiting more detail on the operations of Preston New Road well site. Conclusions on additional sources cannot be made until we have this detail. To enable a full baseline climatology of air pollution to be established it is important to examine the influence of wind direction. Table 16 reports the annual means for pollutant measured under the EU Air Quality Directive whereas Table 17 reports those metrics by individual wind sector (45 deg). In a similar way to greenhouse gases, it is most common in the UK for air from the East (E) and Southeast (SE) to be most polluted as this often brings air from the SE of England and from continental Europe. The lowest concentrations of air pollution are typically observed during periods of westerly airflow. However, this was not the case for KM during this reporting period for all measurements. Whilst the PM measurements showed maxima in the SE and E wind direction, the NOx measurements were most enhanced in the West (W) and Northwest (NW) sectors. This is different to that observed in the previous year (Phase 2) where NOx concentrations were highest in the Southern (S) sector and lowest in the West (W) sector. This change is attributed to the change in activity levels from Autumn 2017 at the KM8 site, when the site entered the ‘pre-operational’ stage. This is discussed more fully in Pre-operational period. Percentiles for all the AQ parameters are displayed in the windroses in Figure 84. Table 17 Annual means for each wind sector for KM site. 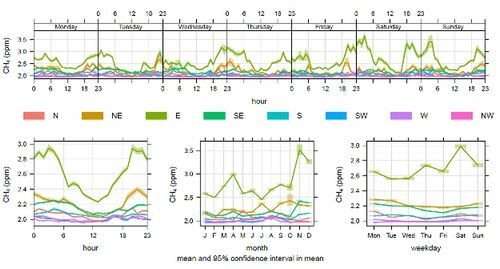 The diurnal air quality profiles for KM are shown in Figure 70. The O3 profile in 2017 is similar to that in 2017 (Ward et al, 2017) with it being lowest at night and peaking just after midday, as expected in the general context of UK oxidative air chemistry. This reflects a combination of boundary layer height and photochemical production during the day and surface loss at night. However the NOx and PM display different diurnal cycles when compared to the previous year. The fact that these are different is the first indication that the PM and NOx may have different sources. 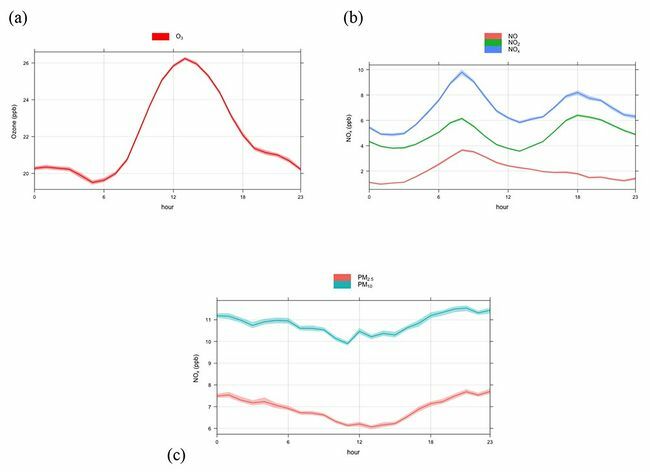 Figure 70 Diurnal variations for (a) O3, (b) NOx and (c) PM. © University of York, 2018. The NOx diurnal profile shows NO and NO2 increasing in the morning and again in the afternoon. This is likely to be due to a combination of boundary layer height and local traffic emission sources. The relative distribution of NO to NO2 is different to the previous year (Phase 2). In Phase 2, NOx was predominately balanced towards NO2, rather than NO indicating that most NO was from regional sources. In Phase 3 (this period) the balance of NOx has been shifted more towards of NO rather than NO2, a clear signal that there was an increase in local sources of NOx emission. Hebdomadal cycles are shown in Figure 71. 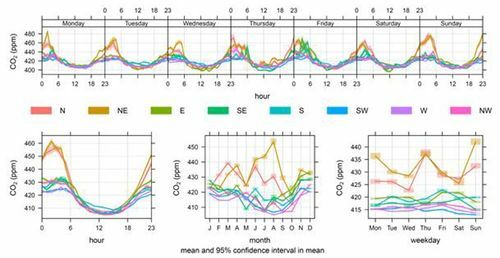 The working week (Mon–Fri) is clear in the NOx measurements with NOx being highest during the week and decreasing at the weekend. Associated with this, O3 is highest on the Saturday which may be due to reduced titration from local NO (Reaction 1). Figure 71 Hebdomadal variations at KM8 for (a) O3, (b) NOx and (c) PM. © University of York, 2018. Before Autumn 2017, the KM site displayed air pollution behaviour that was typical in terms of temporal cycles at other similar locations in the UK (Figure 72). There was however a noticeable change in behaviour from September 2017 onwards, particularly in NOx, and this coincided with developments at the KM8 shale gas site in preparation for hydraulic fracturing operations. From this date onwards there were increased vehicle movements to, from and around the site, and the operation of on-site diesel generators. These are believed to account for the majority of increased in emissions locally; these are discussed more fully in the section on pre operational measurements. 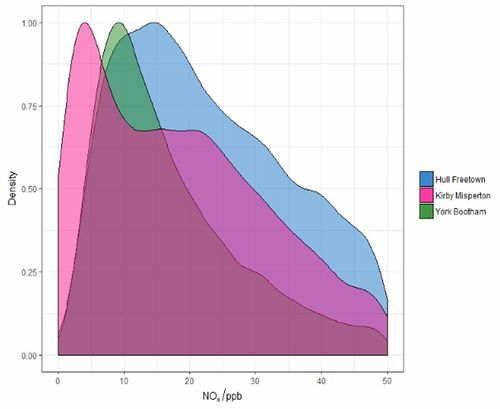 Figure 73 shows percentiles roses for the in situ air quality parameters split by season. A percentile rose places the data into 5 bands (the colour-scale) and then plots each of those by wind direction (radial axis) and concentration. The grey line is the mean for the data set. The plots are separated into season with Spring (March, April, May), Summer (June, July, August), Autumn (September, October, November) and winter (December, January, February). Figure 74 shows polar plots for the same pollutants, with concentrations (colour scale), wind direction (radial scale) and wind speed. Figure 72 Annual cycles at KM for (a) O3, (b) NOx and (c) PM. © University of York, 2018. For many situations concentrations would be expected to decrease with increasing wind speed due to increased dilution but there are some instances where this process can lead to increases, for example due to plume grounding or the transport of air over long distances. Combining the two types of data analysis may give some indication of source regions of pollutants, and this is done below. As in the previous year (Phase 2), O3 concentrations are highest in the spring and winter months from all wind directions except those to the direct south and at the site itself. In the winter months the highest ozone comes from the NE and is highest when wind speeds are higher, this is likely due to the impact of long range transport of this air to the site. By breaking the analysis down into season it can be seen that the peaks in PM are during the winter and when the wind direction is from the east. This winter-time peak in PM is similar in nature to that seen in the spring of Phase 2 measurements. 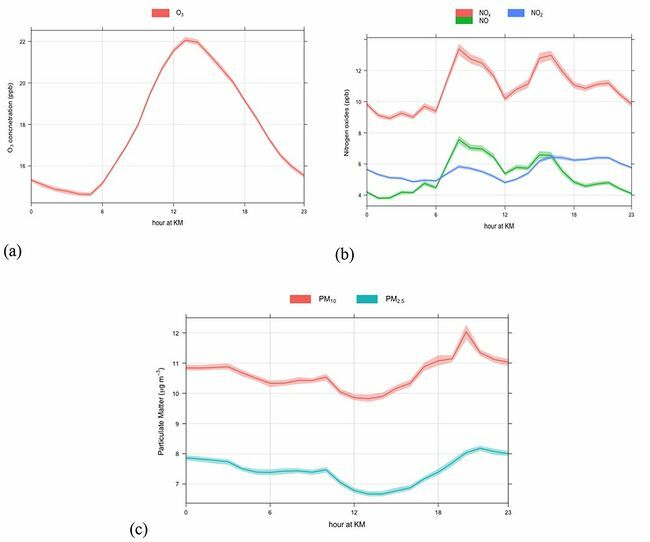 Wintertime NOx does not however show the same structure so it can be assumed that the PM peak is not due to road traffic or generator emissions. The increase in PM in winter could be due to low temperature burning sources in the area, for example stoves and open fires from residential properties. 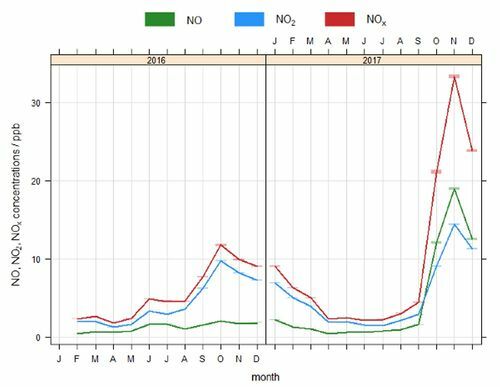 The NOx measurements show a definite peak in the Autumn (September, October, November) and in wind directions from the west; this is best explained by the NOx emissions arising from significantly increased traffic and installation of generators on site during the pre-operational phase. 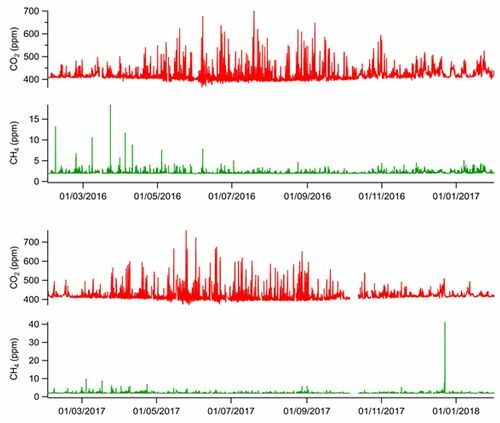 The general trend for higher NOx concentrations from the south in the summer and winter observed in the Phase 2 period, due to extra traffic on the A64, is not as noticeable due to the much higher concentrations from the west in autumn 2017. Figure 73 Percentile rose to show the 5th, and 95th percentiles at KM for (a) O3, (b) NO, (c) NO2, (d) NOx, (e) PM2.5, (f) PM10. © University of York, 2018. 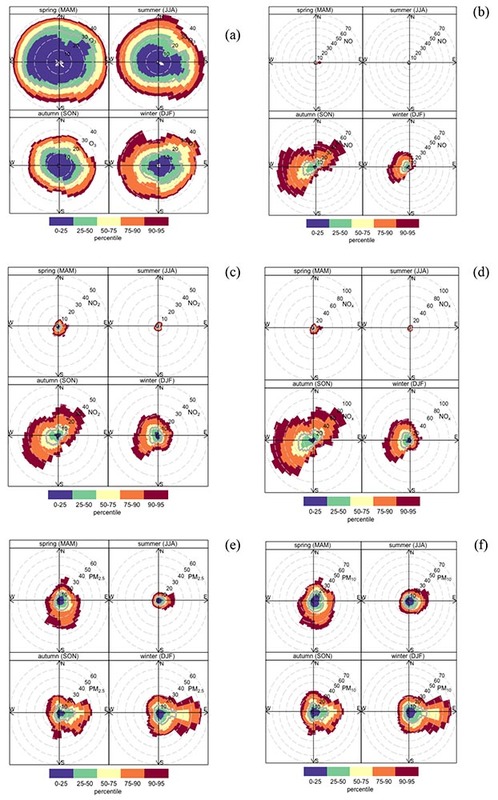 Figure 74 Polar plots for KM for concetrations of (a) O3, (b) NO, (c) NO2, (d) NOx, (e) PM2.5, (f) PM10. © University of York, 2018. From 19th September 2017, the monitoring changed at the KM8 site as Third Energy started to bring equipment on to site in preparation for hydraulic fracturing. This led to a greater number of vehicle movements to, from and on the site, and in the local area. In addition to equipment being brought to site there was also an increase in traffic associated with the local protests and policing. These activities changed the emissions at KM8 and marked the end of the baseline period when activities at the KM8 site and locally were relatively benign. Therefore changes in emission from this point forwards could be considered to be associated with the planned hydraulic fracturing (meant its broadest sense to also include local protest activities. From the 19th September 2017 to the 28th February 2018, the measurement dataset was differentiated and renamed the ‘pre-operational period’. From the 1st March 2018, the removal of equipment from the site was commenced as operations were suspended, without hydraulic fracturing taking place, following continued delay in receiving final approval to carry out hydraulic fracturing. As a result of this, patterns in air quality again started to change again as the site returned towards a more benign state as was the case during the baseline period. The mobilisation/de-mobilisation data set will provide a unique opportunity to observe effects on air quality at a site. An analysis of this transition will be included in a future report. Figure 75 NOx time series at KM from February 2016 to February 2018. © University of York, 2018. 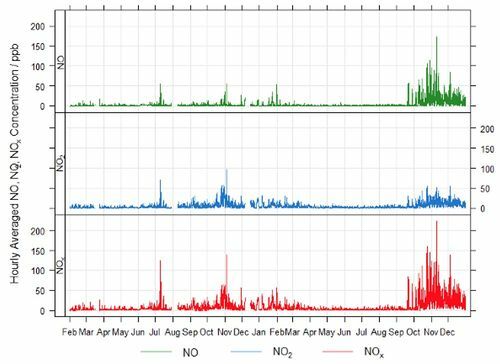 The annual concentration of both NO and NO2 increased significantly in the second half of 2017 and this is evident when looking at the time series of NOx (Figure 75). Enhancements in NOx, in particular NO, can clearly be seen from Autumn 2017. Road transport is the largest source of NOx in the UK, nitrogen oxides formed in combustion systems are mainly emitted in the form of NO. NO2 largely exists as a secondary pollutant formed by the oxidation of NO, however there are certain combustion conditions that can lead to higher proportions of NOx emitted as NO2, for example the oxygen rich environment in a diesel engine aids direct formation of NO2. At KM the close proximity of the monitoring station to activity on site means increased vehicle activity and addition of diesel generators is reflected in the NO and NO2 measurements. A significantly increased peak can be clearly seen in Autumn 2017 when compared to Autumn 2016. Trends at other times of the year are similar across both years. It is expected for NOx concentrations to increase in wintertime and is part of the annual cycle, there tends to be an increase due to more emissions from heating and burning and due to the local metrology and the lower boundary layer. In 2016, the NO2 concentration was generally greater than NO and therefore made the most significant contribution to NOx. The monitoring station is some distance away from the nearest major road (Habton Road) meaning the air at KM will be aged. This allows time for primary emissions of NO to be oxidised to NO2. However, in September 2017 there is a reversal of this trend, where NO begins to dominate NOx, indicative of the change in the source of these emissions. This coincides with the increased activity known to have taken place on site. Figure 76 Monthly averages of NOx at KM. © University of York, 2018. The AURN (Automatic Urban and Rural Network) is the UKs largest monitoring network run by DEFRA (Department of Environment, Food and Rural Affairs) and is used for compliance reporting against Ambient Air Quality Directives. The sites provide high resolution hourly data for a range of pollutants. Each site is given a classification as described in Whilst it does not quite fit all the criteria as specified by DEFRA, KM could be considered as a rural background site. High Muffles is the nearest AURN site to KM and is classified in this category along with Lady Bower (Figure 77). Whilst it does not quite fit all the criteria as specified by DEFRA, KM could be considered as a rural background site. High Muffles is the nearest AURN site to KM and is classified in this category along with Lady Bower (Figure 77). Figure 78 shows the similarities in the probability distribution function of NOx between KM during the baseline period and these other similar rural background sites. However, the data for the ‘pre-operational’ period plotted as frequency density plot shows a very different pattern (Figure 79) to the baseline period. For this period, a much wider and higher distribution of concentrations is observed. The distribution in this period is more similar to urban background sites such as York Bootham and Hull Freetown, which are located within built up urban areas (Figure 77). Table 18 Description of AURN site classifications. Urban Continuously built up area. Suburban Largely built up urban area that may be mixed with non-urbanised areas. Rural More than 5 km from built up areas and major roads. Traffic Pollutant levels largely determined by emissions from nearby traffic. Industrial Pollutant level is predominantly influenced by emissions from nearby industrial source or area. Background Pollutant levels not influenced significantly by any single source or street but by integrated contribution from all upwind sources. Whilst the change in NOx concentrations is clear, these are still well within national air quality limits. However, it does indicate that the characteristics of KM site changed significantly as a result of the preparations being made for hydraulic fracturing-related activities. In terms of the impact on residents living in Kirby Misperton, these plots would suggest that after September 2017 (and until end of February 2018) the levels of NOx pollution at the site were more similar to living in an urbanised area, rather than a rural setting with only a few major roads and industrial sources. Figure 77 Map of KM site and AURN sites (taken from Google Earth). © University of York, 2018. Figure 78 Frequency density plot of rural background sites in the UK, including KM during the baseline period up to beginning Autumn 2017. © University of York, 2018. Figure 79 Frequency density plot of urban background sites in the UK, and the KM site during the pre-operational phase in autumn 2017. © University of York, 2018. Since Autumn 2017, H2S measurement has been added to the KM8 suite of instrumentation. H2S has a strong odour associated with it, often described as a rotten egg smell, and this can be detected by humans a low ppb levels. Although the mean value is 1.1 ppb for KM8, there have been occasions where H2S has been enhanced (maximum in the 1 minute data is 22 ppb). These are well below any health relevant exposure limits (which are at the ppm level). However, odours have been reported in the village. The dataset has therefore been analysed to try and identify any sources of enhanced H2S, and whether these may explain the reported odour incidents. Conditional probability functions (CPF) have been used for this analysis. 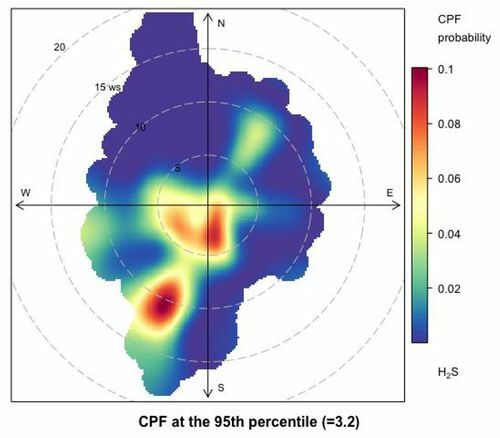 CPF is a useful technique for highlighting which wind directions are dominated by high concentrations and estimating the probability of those events. Figure 80 shows a polar plot of H2S measured at KM8 based on the CPF function. This plots shows that for most wind directions the probability of H2S concentrations being greater than the 95th percentile (3.2 ppb) is zero. The exceptions are when the wind speed is low and from the south west sector which indicates a local source. Given the locations of the peak probability and the monitoring site, these peaks may not be due to operations at KM8, but may be due to work being conducted on the conventional gas wells to the south and west of the site. There is also another unidentified source further away in that sector. There is also a further small source which is NE of the site; this event was detected in the village on the 28th February 2018 and reported to the Environment Agency. Wind direction at the time indicated that airflow was coming from the NE and it was concluded that it was not due to activity on the KM8 well site. CPF analysis confirms this with an increased probability of higher concentrations in the NE. The source of the H2S still needs to be confirmed but could potentially be from a local landfill site. Figure 80 Polar plot of H2S concentrations at KM8 based on the CPF function. © University of York, 2018. Table 19 reports the various air pollutant metrics by species and individual wind sector for the Phase 3 reporting period (February 2017 to February 2018). These are very similar to the Phase 2 results and the same conclusions about sources can be applied for this dataset. The mean concentrations for the Phase 3 period are slightly lower than Phase 2. This is despite the drilling having started at the Cuadrilla site at Preston New Road. As is common in the UK, Easterly and South-easterly air mass are often the most polluted since these bring air from the SE of England and from continental Europe. The lowest concentrations of air pollution are typically observed during periods of westerly airflow. The LP site also has the influence of the major road that is to the south of the site and its influence can be clearly seen in the NOx and PM measurements from those wind sectors. Table 19 LP wind sector averages. Figure 81 Diurnal variations a LP for (a) O3 (b) NOx and (c) PM. © University of York, 2018. LP diurnal cycles are shown in Figure 81. 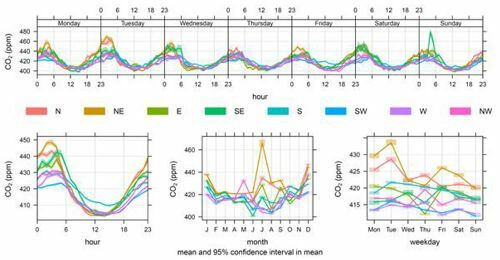 The O3 diurnal cycle is at its lowest at night and peaks just after midday, as previously discussed this is expected in the context of UK oxidative air chemistry. The NOx at LP displays a clear diurnal cycle, but it is different to the KM observations. The PM shows a slight diurnal but this is not as clear as previous measurements. The diurnal cycle at LP is heavily influenced by the larger nearby road traffic source, with NOx increasing in the morning, due of the boundary layer and heavier local traffic at this time. The early evening peak is again due to the second rush hour. The smoothing of the peaks in the PM diurnal may indicate a further more constant source of PM. LP hebdomadal cycles are shown in Figure 82. The working week is clear in the NOx and PM measurements with highest daily averages found during the week and decreasing concentrations at the weekend. O3 is highest on a Thursday; this coincides with a decrease in the NOx measurements. A similar pattern was observed in the Phase 2 data but on a Wednesday. It is still unclear why this difference should occur as there are no immediate reasons why traffic volumes may be lower at certain times. There have been active protests in the area so it may be that certain road closures have led to this effect being detectable in atmospheric concentrations. Figure 82 Hebdomadal cycles at LP for (a) O3 (b) NOx and (c) PM. © University of York, 2018. 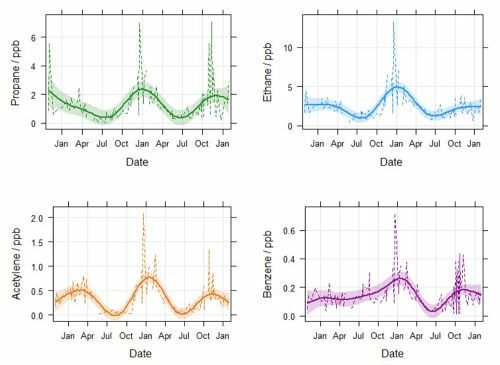 The LP ozone instrument underwent maintenance in June–July and December so a full annual cycle was not collected but the data that are available show the expected UK ozone increase in spring, as discussed in the KM section earlier. The other air pollutants, NOx and PM also show typical annual cycles in the context of UK air quality and have already been partially discussed previously. Annual cycles for the in situ air quality parameters are shown in Figure 83. Figure 83 Annual cycles at KM for (a) O3, (b) NOx and (c) PM for 2017. © University of York, 2018. 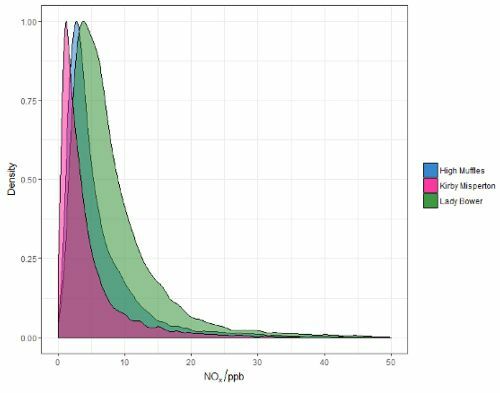 Figure 84 shows percentiles roses for the in situ air quality parameters split by season. A percentile rose places the data into 5 bands (the colour-scale) and then plots each of those by wind direction (radial axis) and concentration. The grey line is the mean for the data set. The plots are separated into season with Spring (March, April, May), Summer (June, July, August), Autumn (September, October, November) and winter (December, January, February). Figure 85 shows polar plots for the same pollutants, with concentrations (colour scale), wind direction (radial scale) and wind speed. NOx sources are seen to the south east of the site which is attributed to road traffic but there is also a strong source directly west of the site. This source was not observed in the previous Phase 2 data and is most likely due to the developments taking place at the Preston New Road site to the direct west of the monitors. Currently this is not having the same scale of effect on concentrations as has been observed at KM in autumn 2017. It should be noted that operations at the two sites are currently very different. A large source of PM to the south east of the site is visible, recreating a feature seen in previous data from 2016. This has been determined to be a local influence. There are slightly enhanced PM measurements in the westerly air masses, showing the influence of the Atlantic air masses, especially in the coarser fraction arising from atmospheric aerosols. 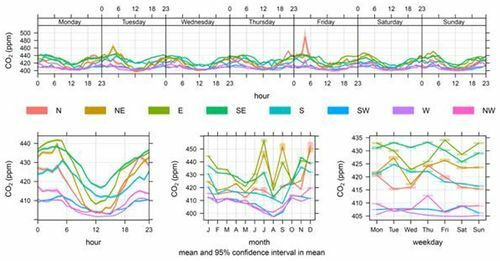 Enhanced PM in airmass from the SE is related to some general increases also in NOx in the same wind direction indicating that these higher values are associated with regional transport of air pollution from other UK regions to the site, and in contrast to cleaner Atlantic air masses. Figure 84 Percentile rose to show the 5th, and 95th percentiles for (a) O3, (b) NO, (c) NO2 (d) NOx, (e) PM2.5, (f) PM10. © University of York, 2018. Figure 85 Polar plots for LP (a) O3, (b) NO (c) NO2, (d) NOx, (e) PM2.5, (f) PM10. © University of York, 2018. Non-methane hydrocarbon (NMHC) measurements have been made weekly at both sites. The NMHC are not continuous but as only one discrete sample a week. This may not be taken when the wind direction is downwind from site, so the results need to be interpreted carefully. A summary of NMHC concentrations for KP and LP is shown in Table 20 and Table 21 respectively. 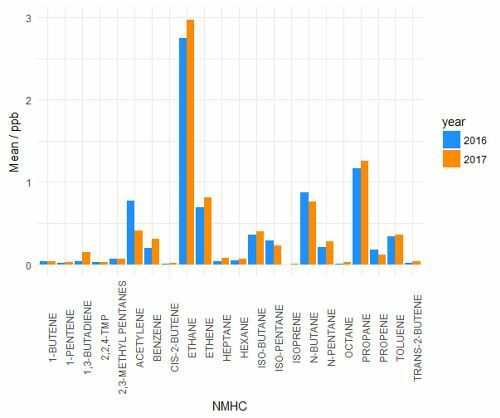 NMHCs are able to give an indication of air mass origin and age since fresh pollution was added; in areas of oil and gas production higher light alkanes such as ethane and propane may be enhanced over typical urban distributions due to fugitive emissions. NMHC data are shown until mid-January 2018. These data are also summarised as box and whisker plots in Figure 86 and Figure 87. Table 20 Summary of NMHC measurements at KM, N = 62. All NMHC have an uncertainty of <10%. Table 21 Summary of NMHC measurements at LP, N = 45. Figure 86 Box and whisker plot of NMHCs measured at KM in 2016 and 2017. © University of York, 2018. Figure 87 Box and whisker plot of NMHCs measured at LP in 2016 and 2017. © University of York, 2018. Figure 88 shows the annual means of the non-methane hydrocarbons measured at KM. Ethane and propane are the most abundant compounds measured throughout both years at both sites. There were no significant differences between the means for 2016 and 2017 for both locations. Figure 88 Mean mixing ratios of NMHCs at KM for 2016 and 2017. © University of York, 2018. Figure 89 Mean mixing ratios of NMHCs at LP for 2016 and 2017. © University of York, 2018. 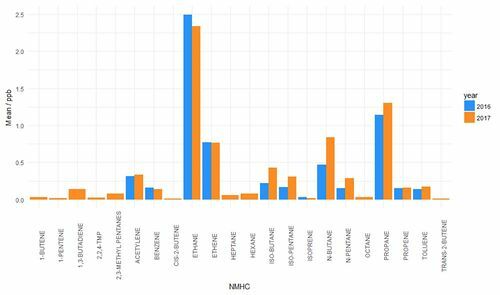 Figure 90 Seasonal variation in selected NMHCs at KM from December 2015 to January 2018. The dotted lines show the actual concentrations measured, the smooth line is the trend. © University of York, 2018. Figure 91 Seasonal variation NMHCs at LP from February 2016 to January 2018. The dotted lines show the actual concentrations measured, the smooth line is the trend. © University of York, 2018. The seasonal profiles for ethane, propane and acetylene are shown in Figure 90 for KM and Figure 91 for LP. A clear annual cycle is visible in the data with a summer minimum and a winter maximum. The reduction of concentration in the summer is predominantly due to the enhanced oxidation of NMHCs as a result of the reaction with the hydroxyl radical (OH). In winter, concentrations are also affected by boundary layer depth and atmospheric stability, where the boundary layer can more frequently be lower, resulting in the higher concentrations of NMHCs. The only two NMHCs which are currently legislated with limit values are benzene and 1, 3 butadiene. The annual mean values at both sites are well below the limit value for the UK. 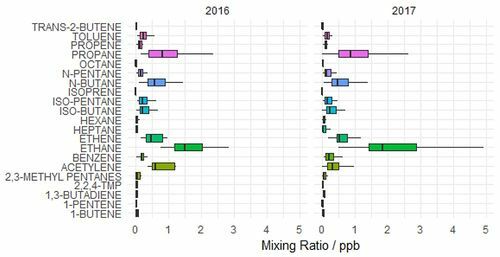 The baseline distribution of air pollutants measured at LP has been broadly similar in 2017 to previous years, but there have been substantial changes observed at KM. Although hydraulic fracturing has no taken place at KM, there was a noticeable increase in NOx as the site was prepared for operations to begin. From the Autumn 2017, when equipment was allowed on to the site, local NOx emissions were enhanced due to additional vehicle movements (on site and off site) and the operation of diesel generators. The most clear evidence for these being local sources of NOx was the shift in NO2:NO ratio away from NO2 and towards more direct NO. Once equipment was removed from the KM site the NOx concentrations returned to broadly the same concentrations seen previously during the baseline period. 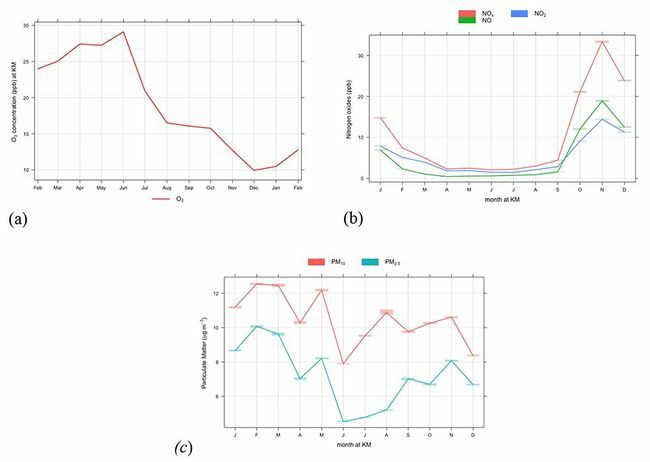 This highlights the importance of measuring the whole shale gas operational cycle for air quality as the preparative operations can have a substantial impact on air pollution. The process of equipment being brought to site, and the operation of additional support equipment (e.g. pumps, generators, etc) leads to additional air emissions. The ‘pre-operational’ phase at the KM site changed the atmospheric characteristics of the location. The monitoring data shifted from having concentrations and behaviours typical of a rural background location, to behaviours more similar to an urban background location. It should be noted however that whilst the preoperational phase at KM led to increases in some air pollutants, no air quality limits were exceeded. This page was last modified on 11 February 2019, at 10:10.